Just arrived off the port from Ghent via Workington anchorage to await high water. 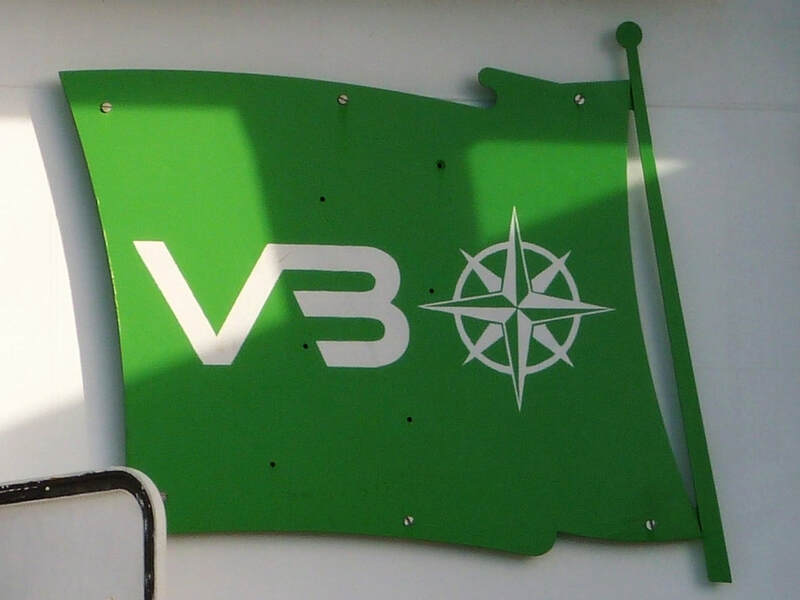 It was an icy morning with only the brave venturing outside. 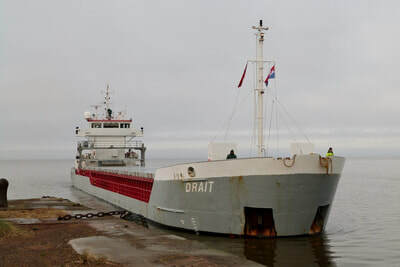 The cold calm conditions allowed for a graceful approach & entry to the dock. ​Pilot & Master appeared satisfied with progress as the ship passed through Marshall Dock towards the dock gates. 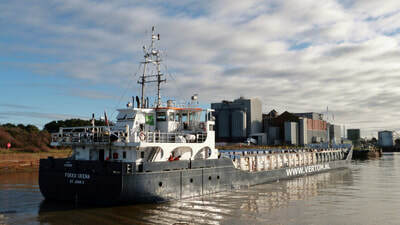 The gallery shows the approach, passage through the tidal dock & manoeuvring in New Dock where she was tied-up. 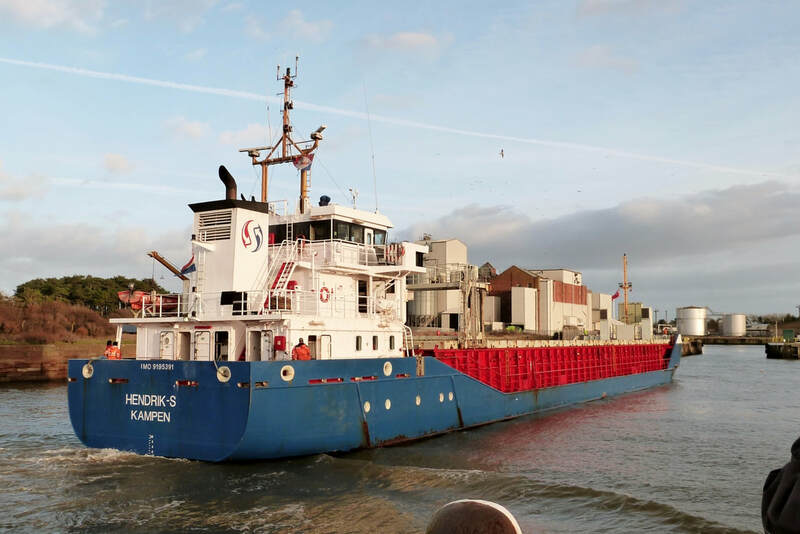 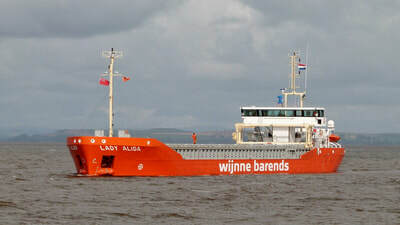 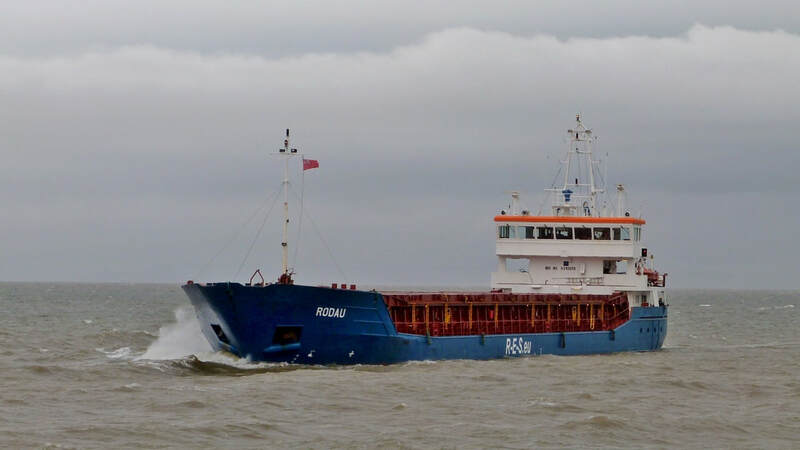 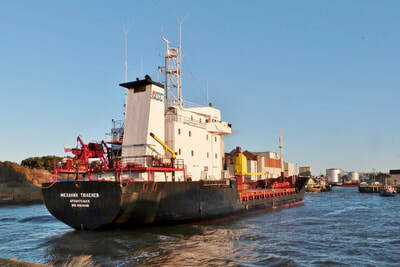 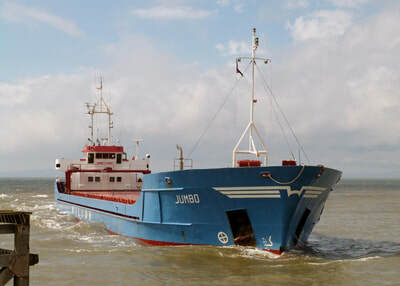 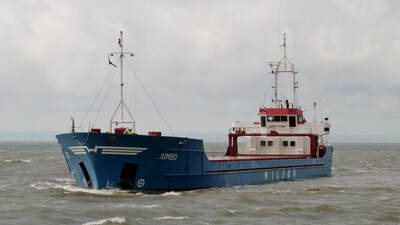 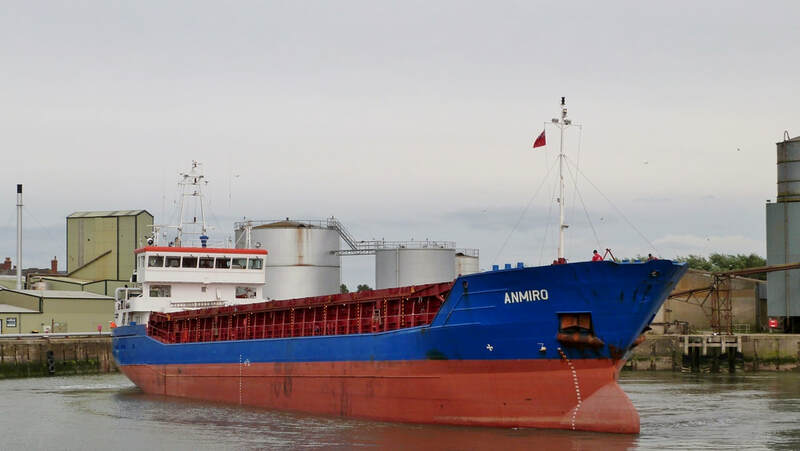 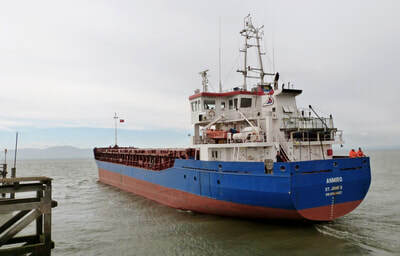 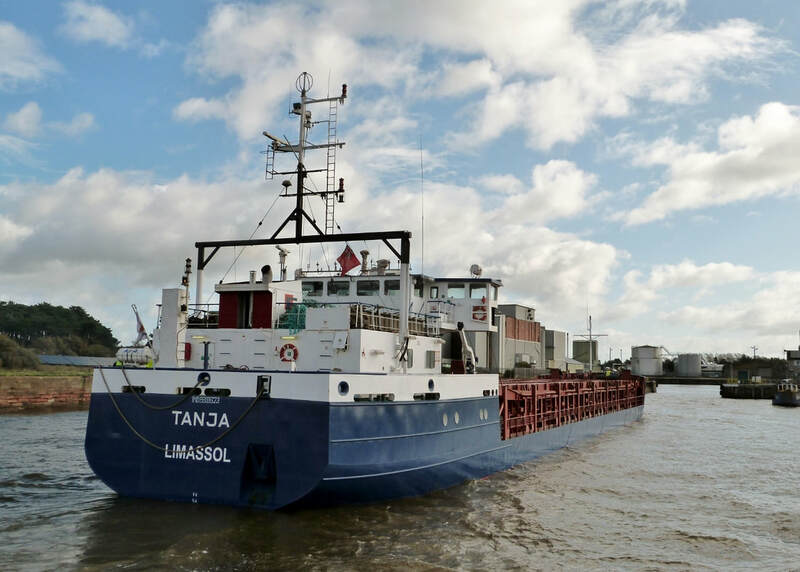 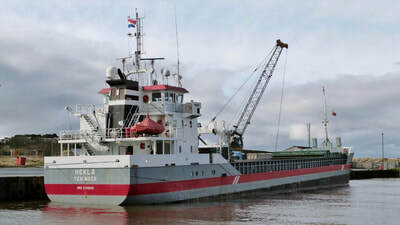 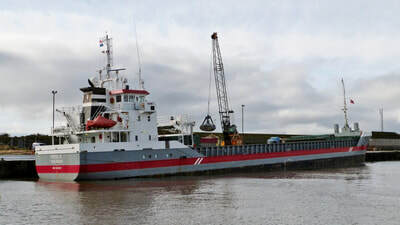 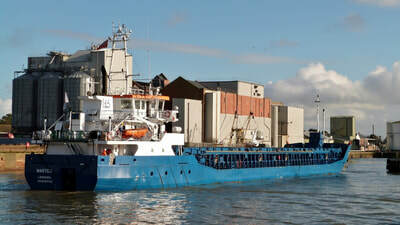 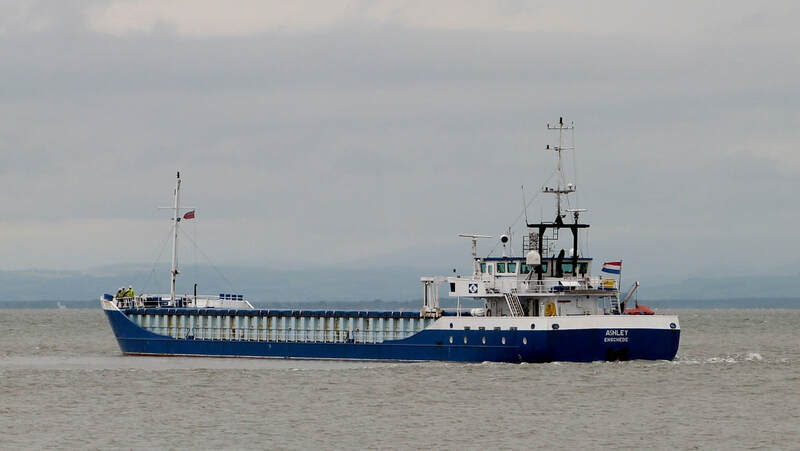 The 3,650tn DWT general cargo vessel belongs to the expanding fleet of the Dutch company 'AMASUS'. 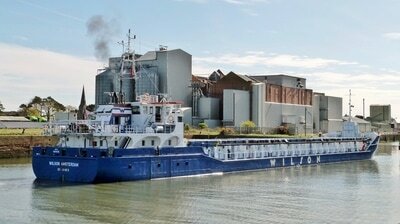 Inbound from Mukran, Germany on a bitterly cold afternoon. 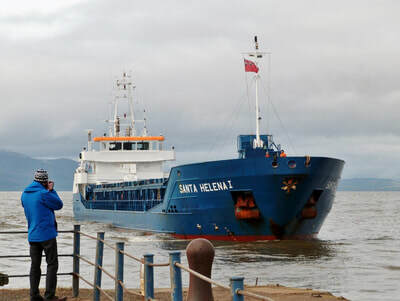 The vessel had arrived off the Cumbrian coast after a 5day sailing from the Baltic. However Storm Caroline was imminent & she needed to seek shelter in Ramsey Bay for 3days before conditions eased sufficiently to dock at Silloth. 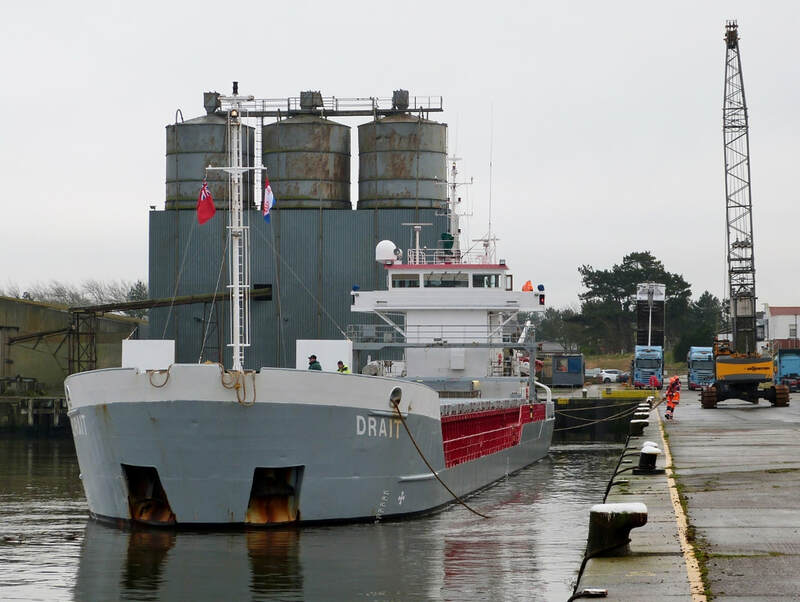 The 85m 2,650ton DWT vessel is one of a fleet of nine in her class equipped with two deck cranes. 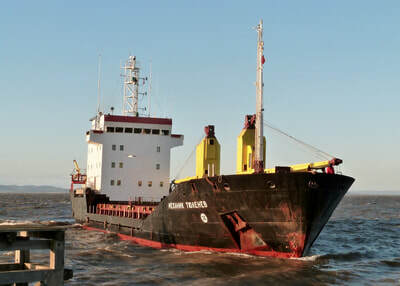 She is owned by 'Northern Shipping', a long established company based in Archangelsk, northern Russia. 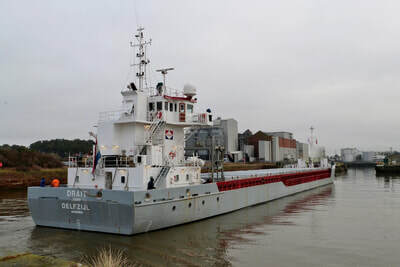 Inbound from Antwerp with fertiliser. 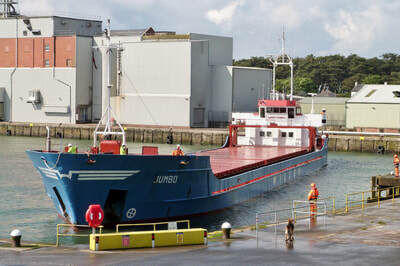 The 88m long vessel is photographed as it turns towards the unloading quay. 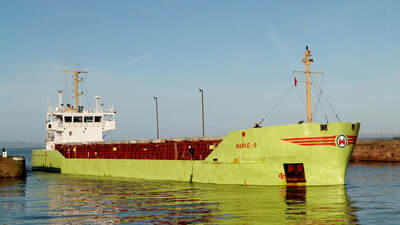 The 3,000ton DWT vessel, built in 1987, is the ex MARIE LEHMANN. 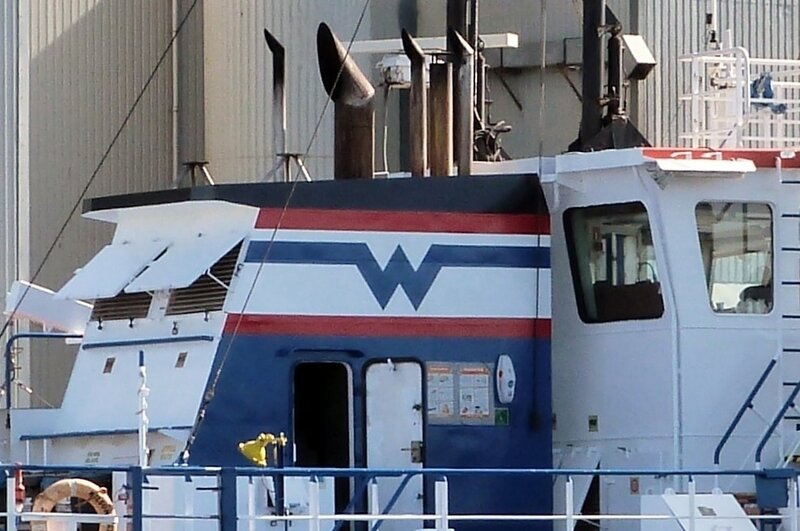 She has an unusually straight bow design. 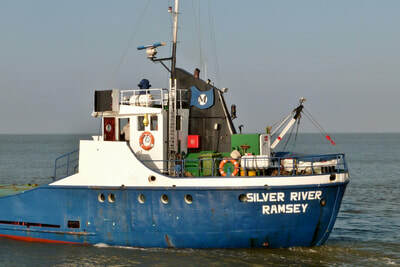 The new owners have retained the old livery & conveniently painted the new name off-centre at the stern. The gallery shows the approach to the dock entrance, passing into New Dock & more shots of the turn. 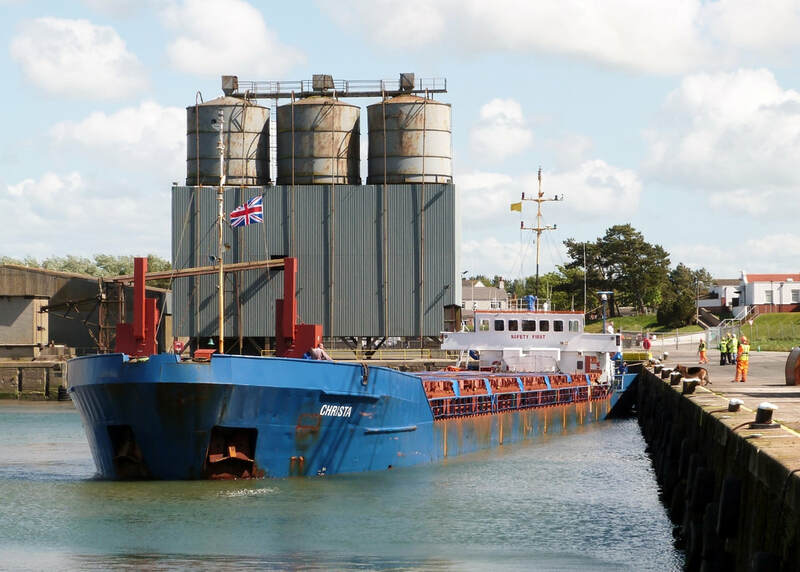 Lining up to enter port on the midday tide having arrived from Les Sables-d'Olonne with wheat. 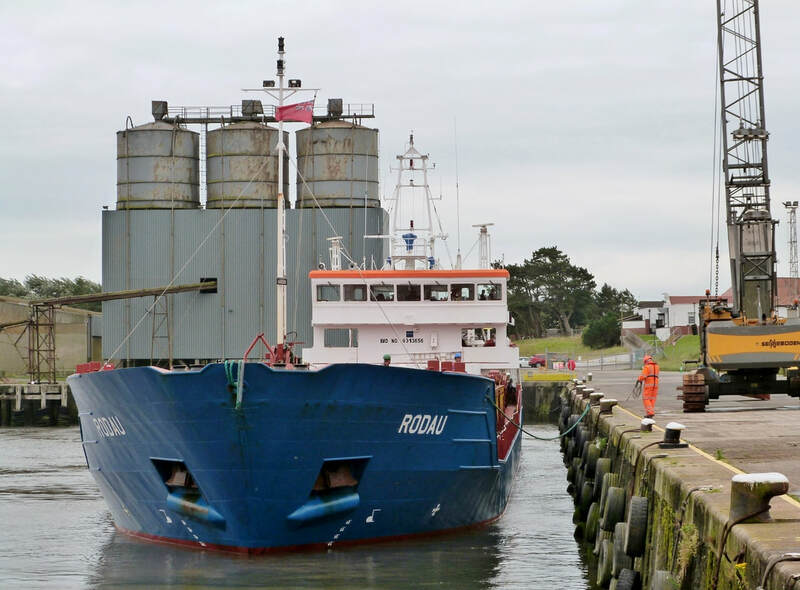 It had been a 3day sailing from the French port on the Bay of Biscay. Favourable tidal conditions allowed the pilot to make his approach some 20min earlier than normal for arrivals. 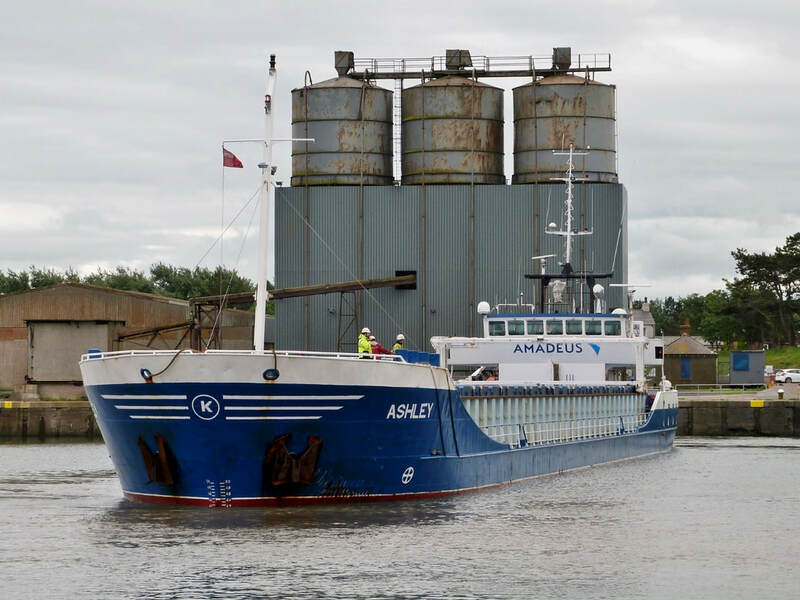 ​The vessel, built in 2009 with a DWT of 2,600ton, is managed by the expanding Dutch company 'Amasus'. 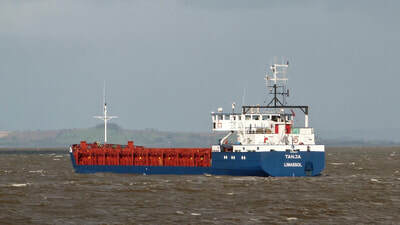 ​Conditions were calm with weak sunshine for the approach & entry to port. 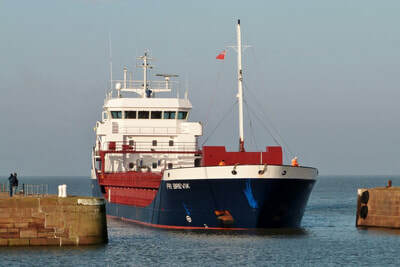 ​The ship then turned in the New Dock towards the discharge quay. 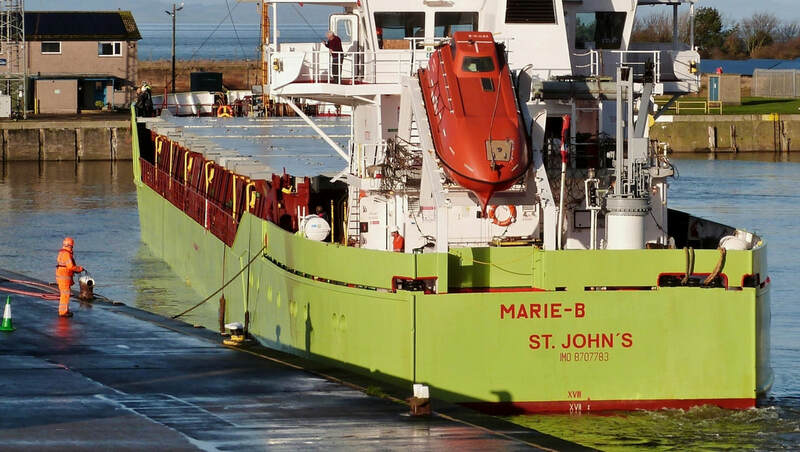 Autumn sunshine illuminates the vessel turning in New Dock shortly after arrival from La Pallice, France. 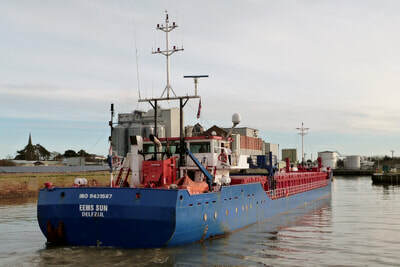 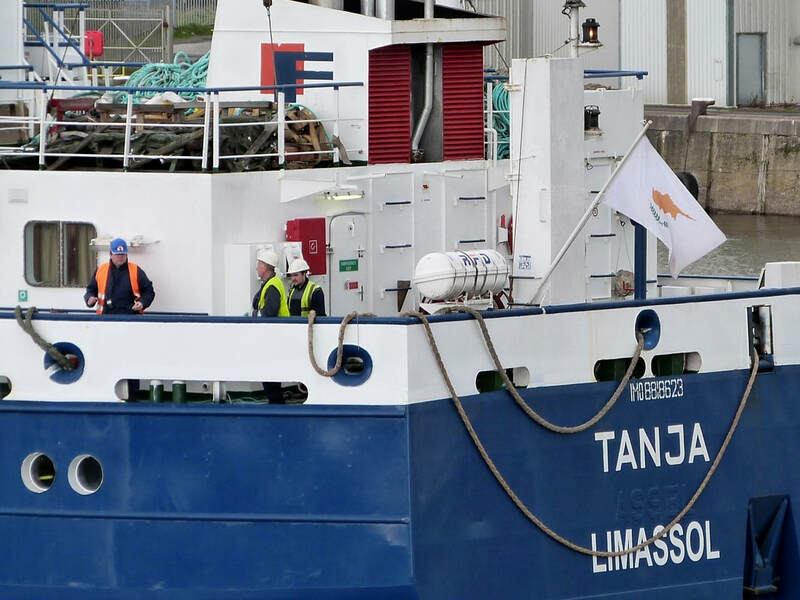 ​The vessel, one of three owned by 'Steenstra Shipping', is managed by 'Amasus'. At 3,100tons DWT she is typical of the general cargo vessels delivering wheat on short European routes. 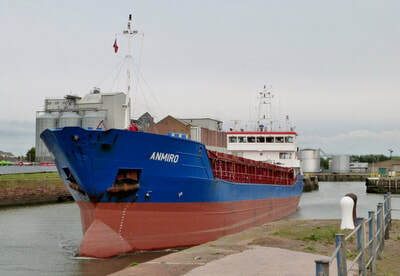 ​The sailing from the Bay of Biscay had taken 3days, arriving in good time for the mid-afternoon tide. 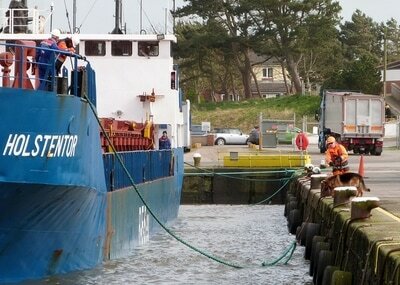 ​The gallery covers arrival off the port through to the manoeuvre at the unloading quay ​30mins later. 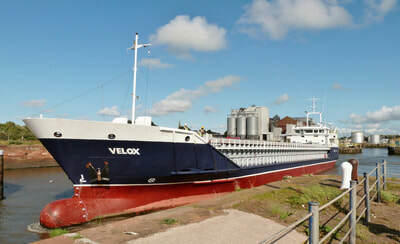 Hazy autumnal sunshine to greet the arrival from Antwerp. Below she is seen turning towards the unloading quay. 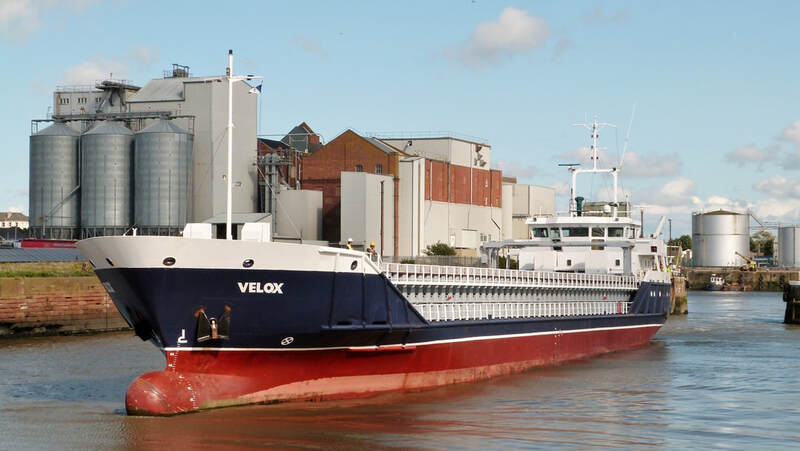 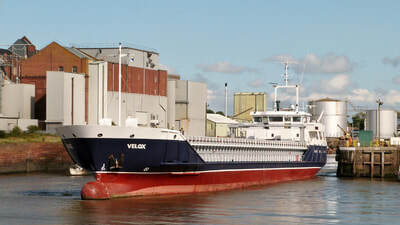 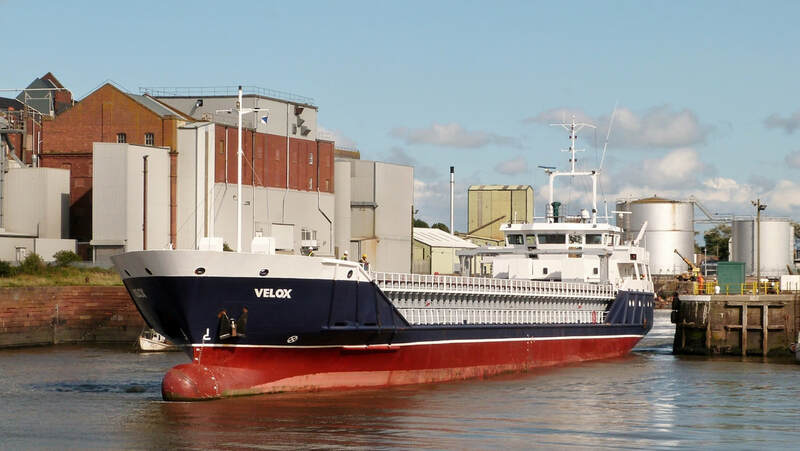 ​Built in 2007, the 3,600ton DWT vessel is one of Vertom's expanding fleet of 75. ​The gallery shows a text-book approach past Criffel & passage into New Dock in calm conditions. 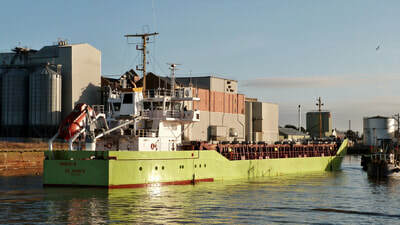 ​She is then turned & brought alongside the south quay where her cargo of fertiliser will be unloaded. 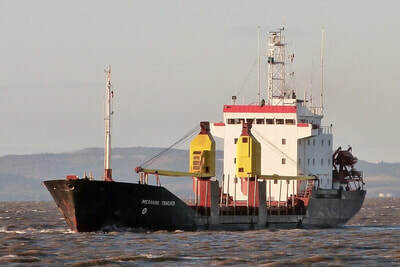 Inbound from Nantes passing Criffel in the background. ​Seen arriving on the midday tide after a 3day sailing from the French port with grain. 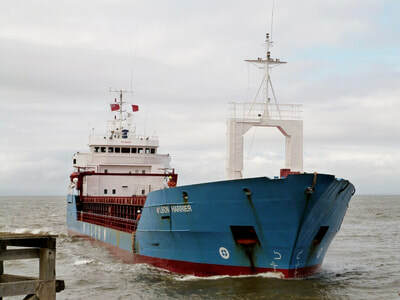 ​The Cyrpus-registered vessel is owned by the fleet management arm of 'Forsa Shipping' based in Klaipeda, Lithuania. 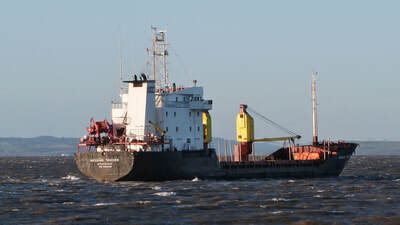 ​She was built in Germany in 1989 with a max deadweight of 3,300ton. 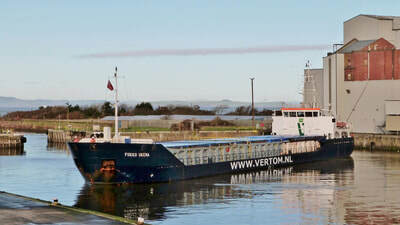 ​After a 24hr turnaround she was on her way to her next port of call, Belfast. 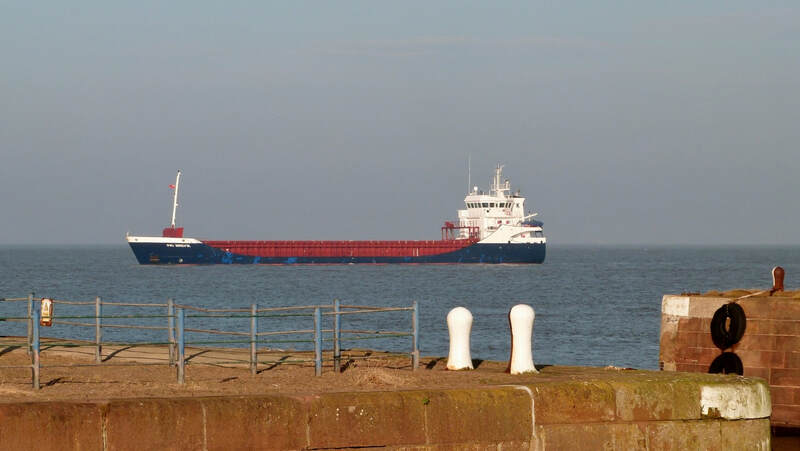 Hazy morning sunshine to greet the arrival from Amsterdam after a four day sailing. 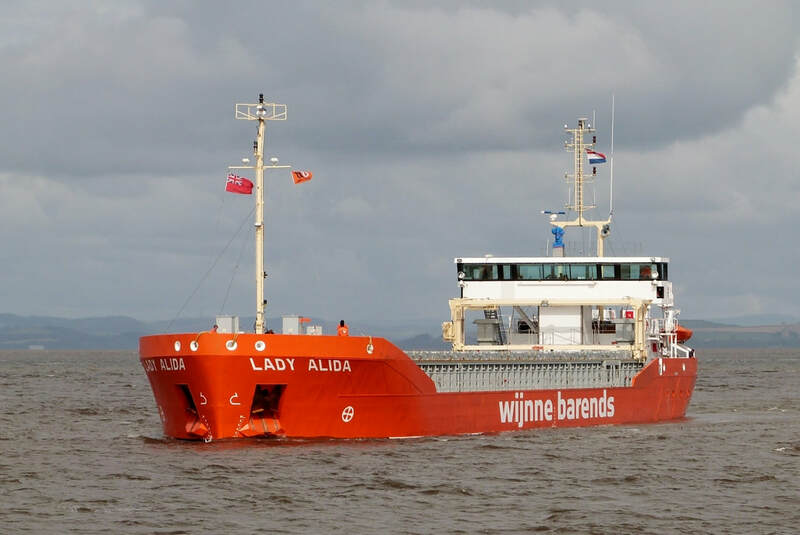 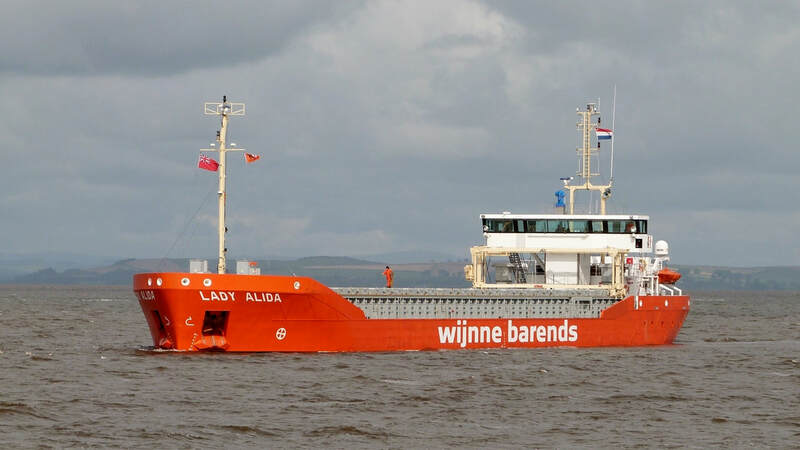 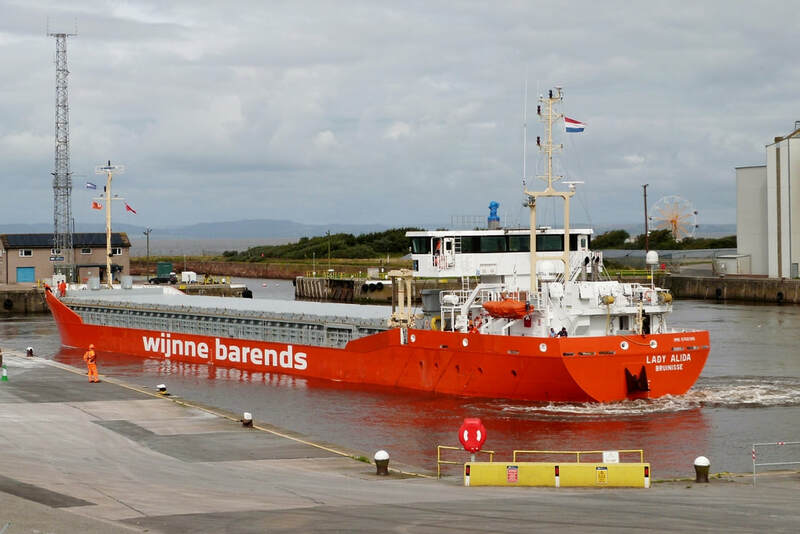 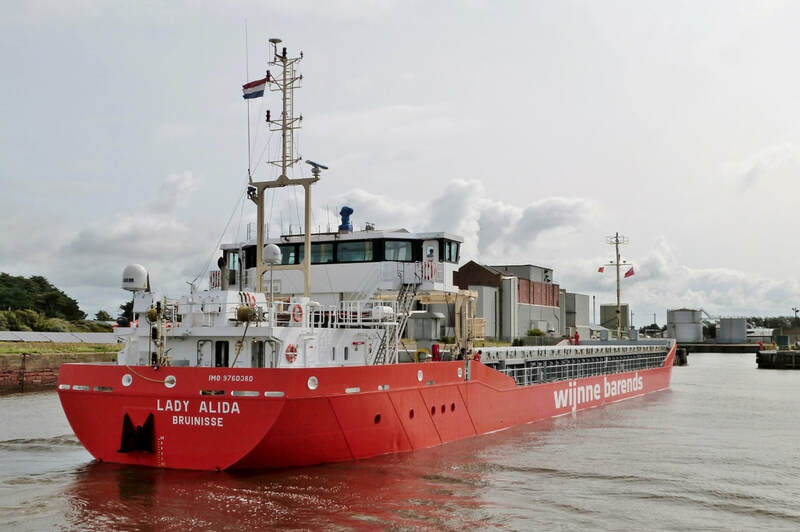 The almost new (2016) 3,700ton DWT vessel belongs to the long established shipping company, 'Wijnne Barends'. 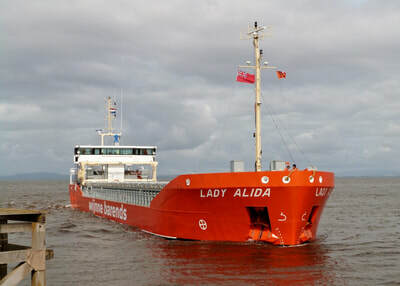 She is one of the expanding 'Lady A' class which began to be delivered in 2012. 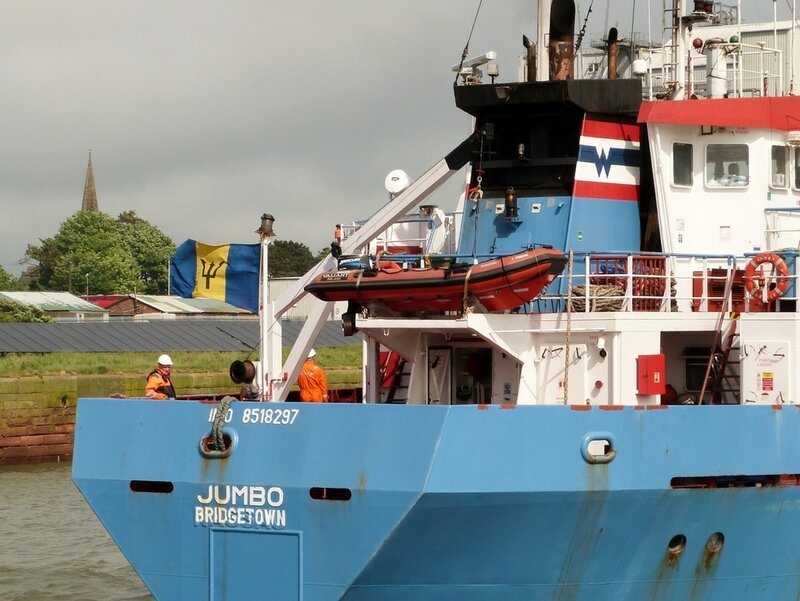 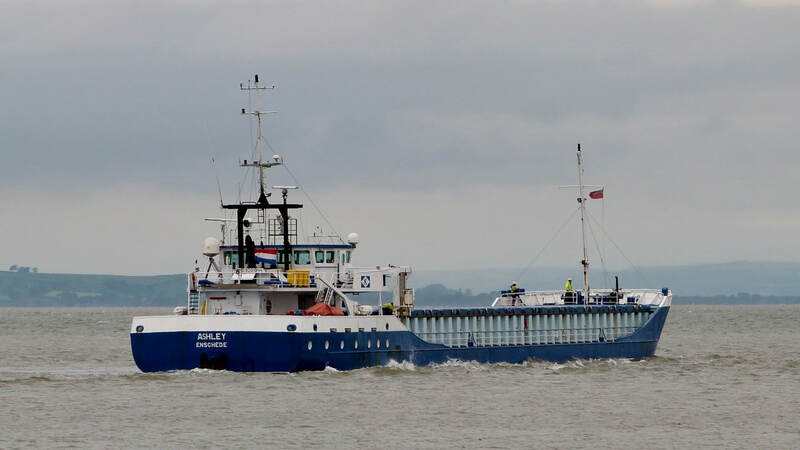 ​The Dutch registered vessel is flying a full set of company & national flags. ​The gallery shows a smooth passage into the dock where she was turned & berthed at the unloading quay. 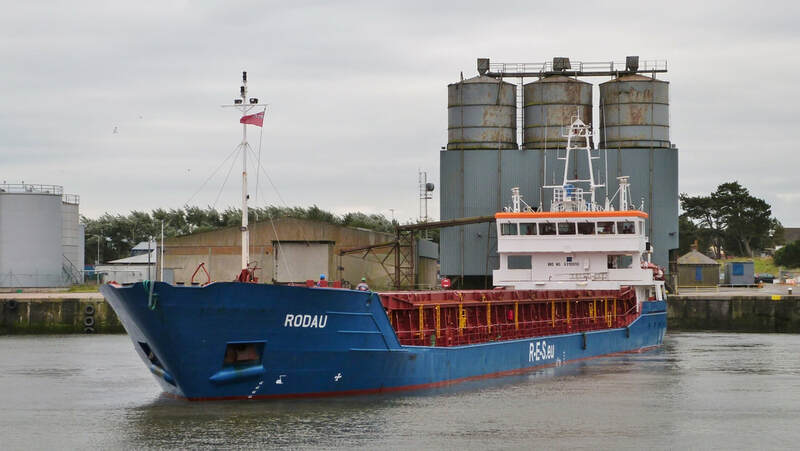 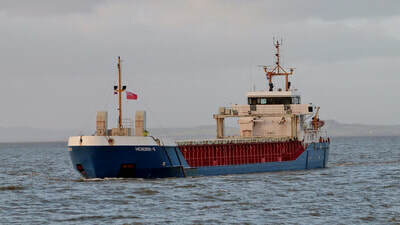 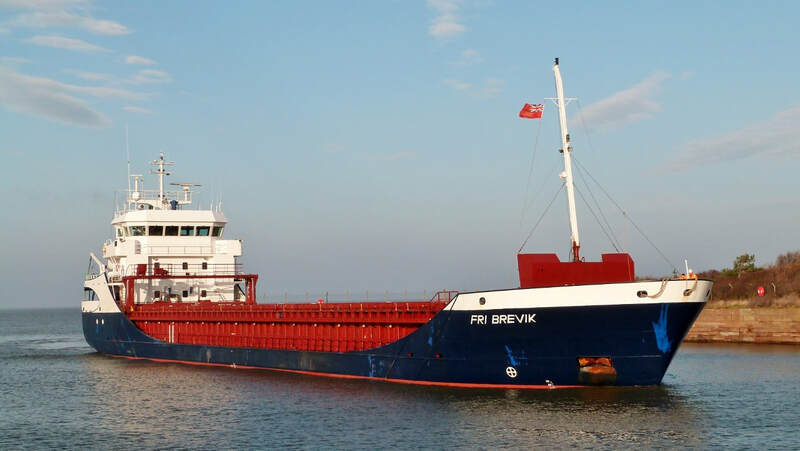 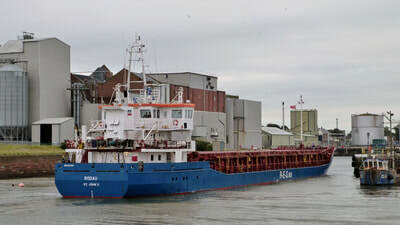 ​The sailing from the Netherlands was uneventful on this occasion but in March the vessel suffered engine failure in stormy weather off Cornwall en route to Ireland. 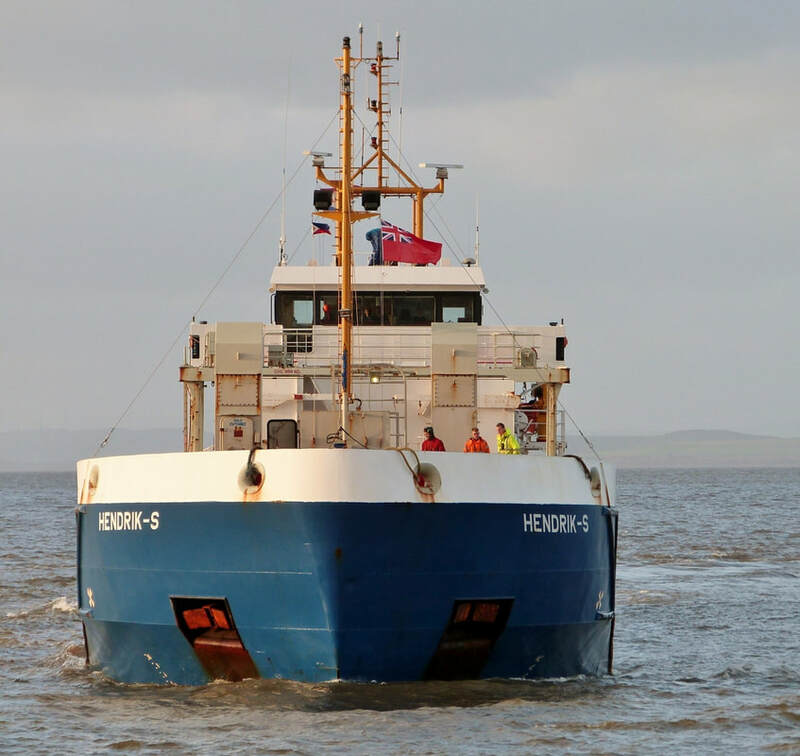 She was drifting towards the coast when Sennen & Penlee Lifeboats attended to tow her out to sea. 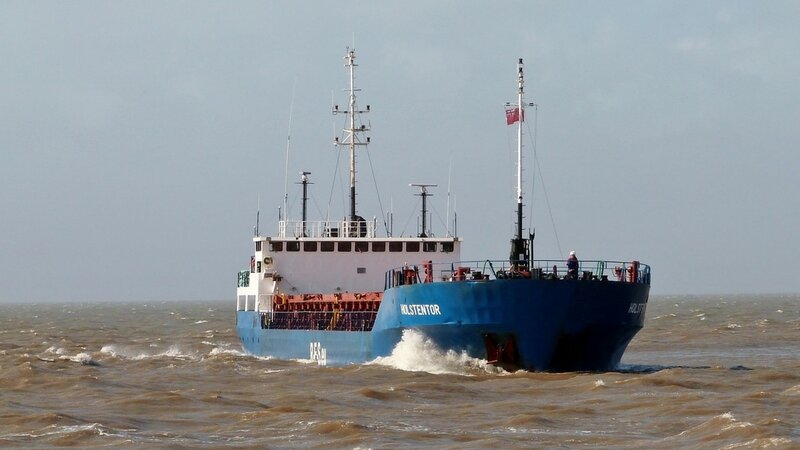 However, some hours later she began dragging anchor and both lifeboats returned to tow her out to sea again to await the arrival of a tug. 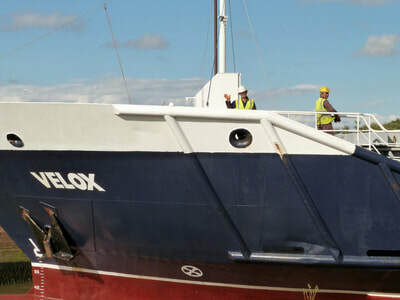 The video shows a line being passed from the Sennen Lifeboat. 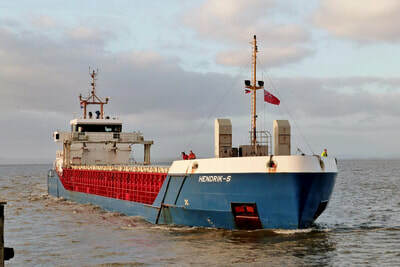 After being towed to Falmouth she underwent repairs and was then able to continue the sailing to Waterford with her cargo of sand. Outbound for Wicklow, Ireland after making a delivery of French wheat. 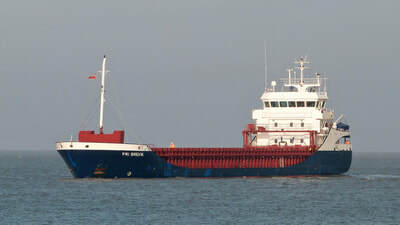 ​The vessel had arrived on a dull afternoon three days earlier from La Pallice on the French Atlantic coast. 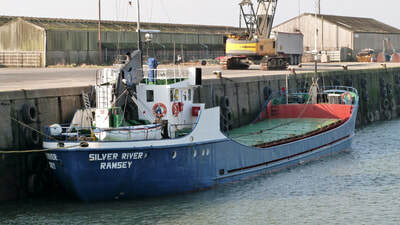 The vessel is one of ten owned by Faversham Ships based on the Isle of Wight. 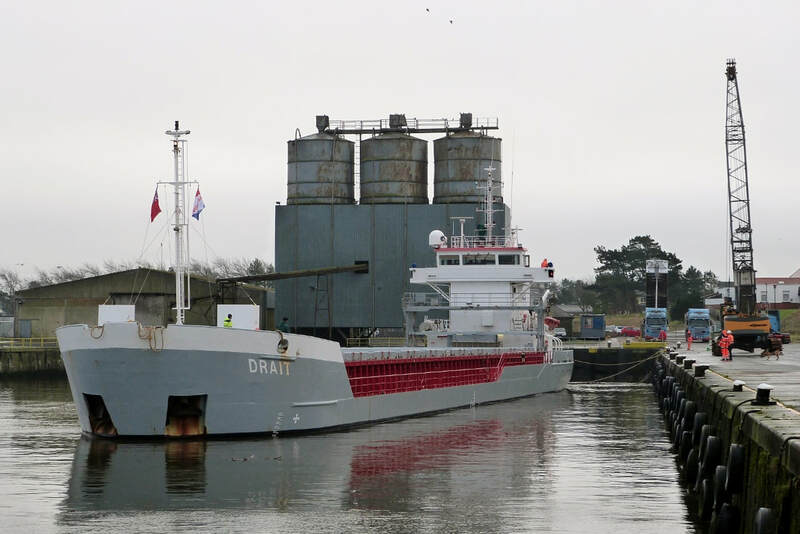 Built in 2000 as 'LINGEDIJK', the 3,300ton DWT vessel was acquired by Faversham in 2013. 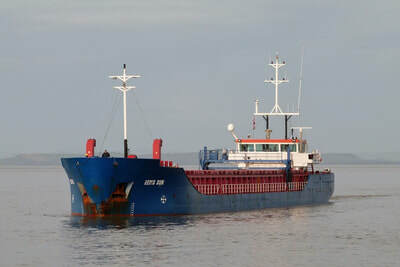 She is registered in the Isle of Man as are several others of the fleet. 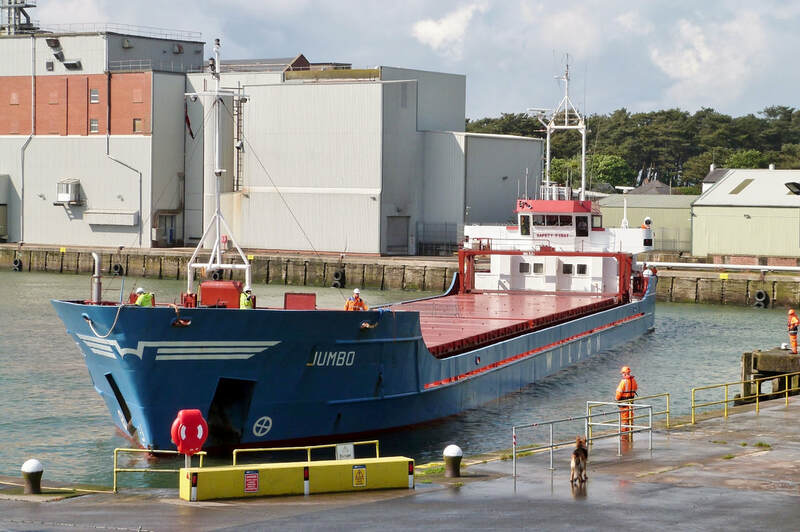 The weather had delayed unloading of the water-sensitive cargo but departure was made on a bright afternoon with the crew looking pleased to be on their way. 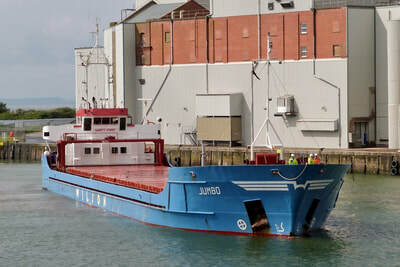 ​Arriving off the port on a blustery afternoon with a cargo of fertiliser from Aviles, N.Spain. The 3,700ton DWT general cargo vessel is one of 25 of R.E.S Group's mid-range fleet. 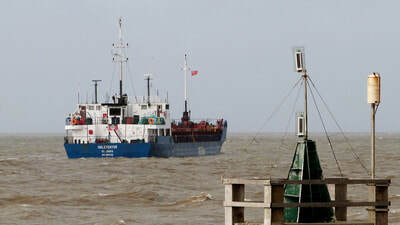 ​The prevailing south-westerly was easily handled by the pilot at the entrance to Marshall Dock. 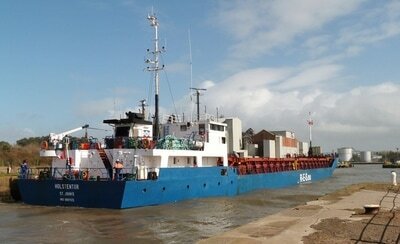 Once in the shelter of the New Dock the vessel was turned & berthed alongside the unloading quay. Inbound from Klaipeda shortly after 'KREMPERTOR" departed for Belfast. 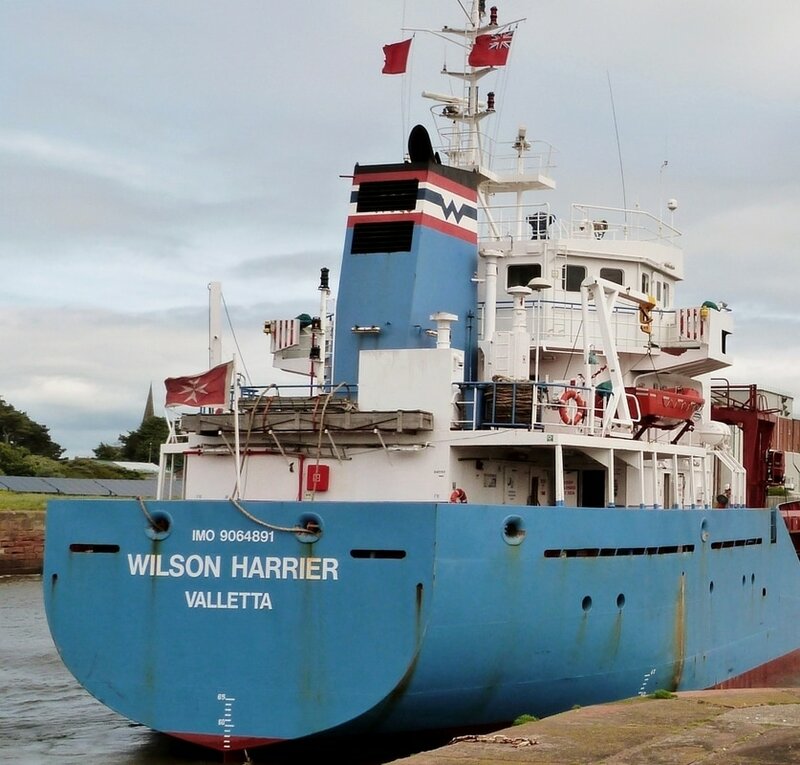 ​"HARRIER" is the latest of several 'Wilson' ships to visit the port recently with fertiliser from the Baltic. 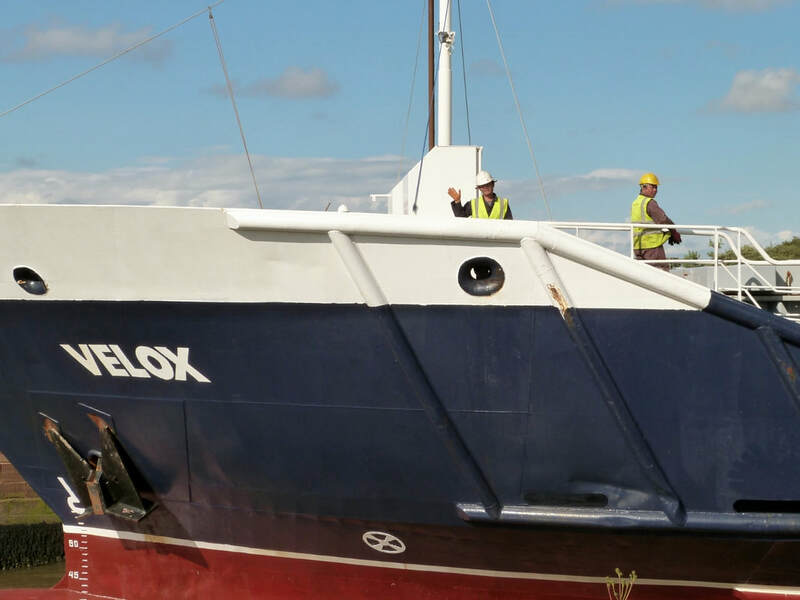 It's a 7day sailing via the North Sea, Pentland Firth & West of Scotland. 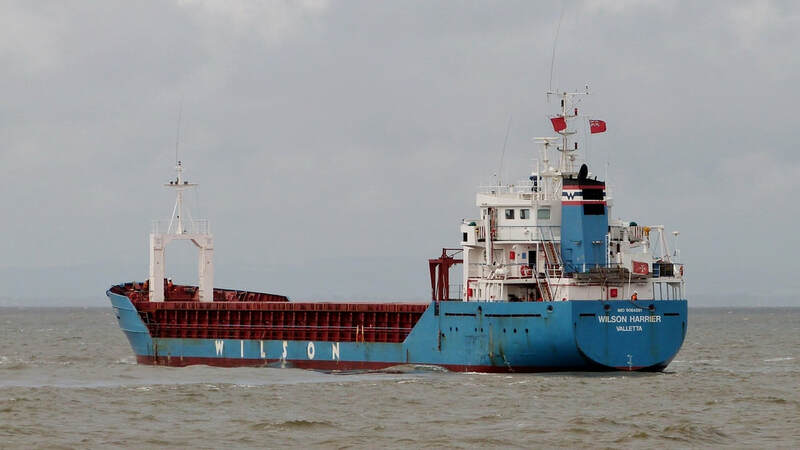 ​The 4,250ton DWT vessel, owned by 'Wilson', forms part of their large mid-range fleet of owned & chartered vessels. 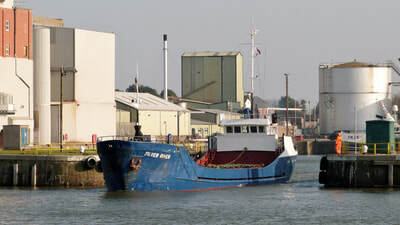 ​The gallery shows a straightforward approach & entry to the dock. 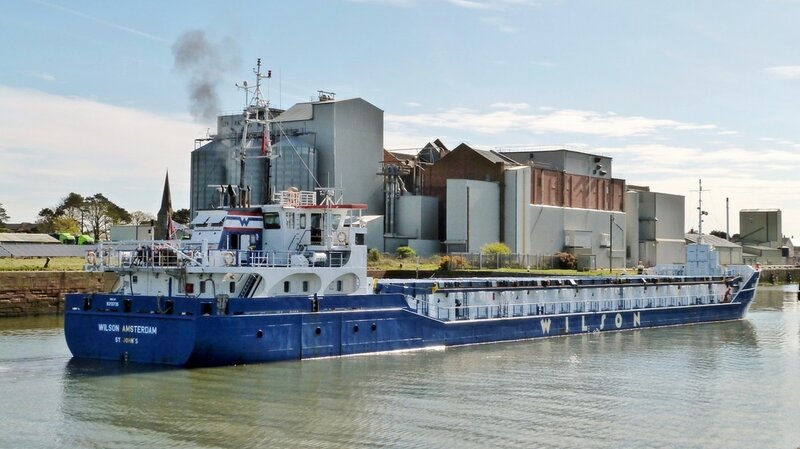 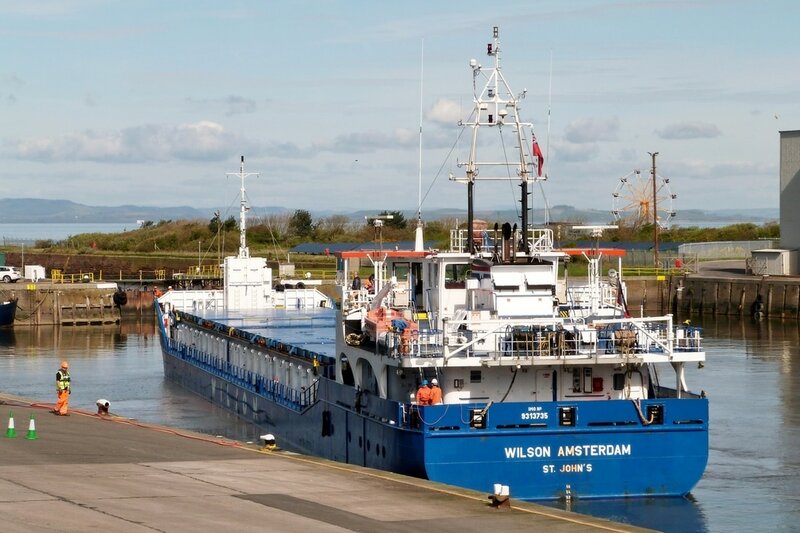 ​'Wilson' has a reputation for a reliable & well-maintained fleet but on this occasion the vessel had bow thruster problems resulting in berthing taking twice as long as normal. 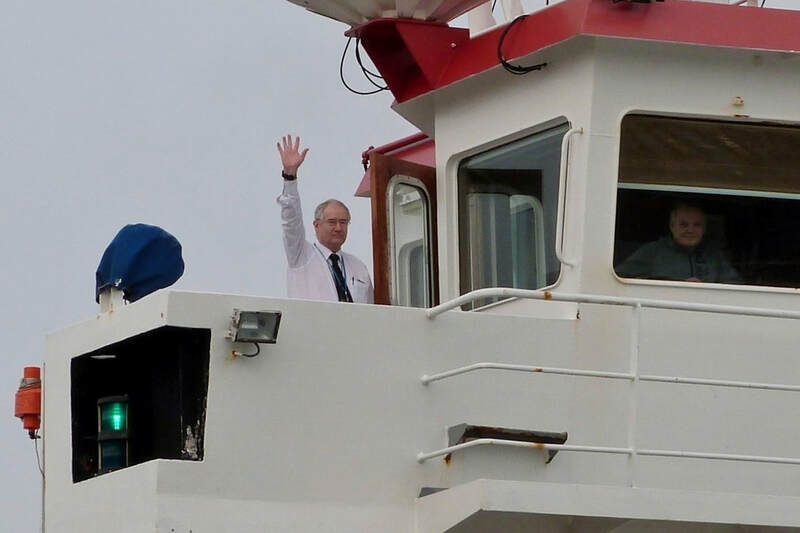 Just in time to catch the departure for Belfast. 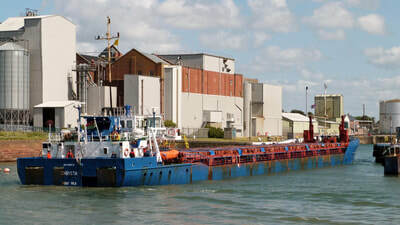 The 3,400ton DWT general cargo vessel is piloted out of the dock in ballast after delivering wheat from La Pallice. 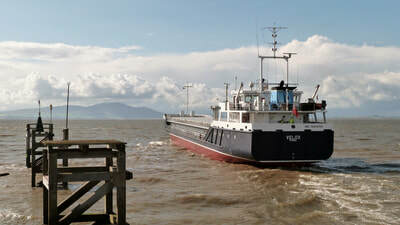 She is owned by R.E.S Group whose vessels are regular visitors to Silloth & Workington. 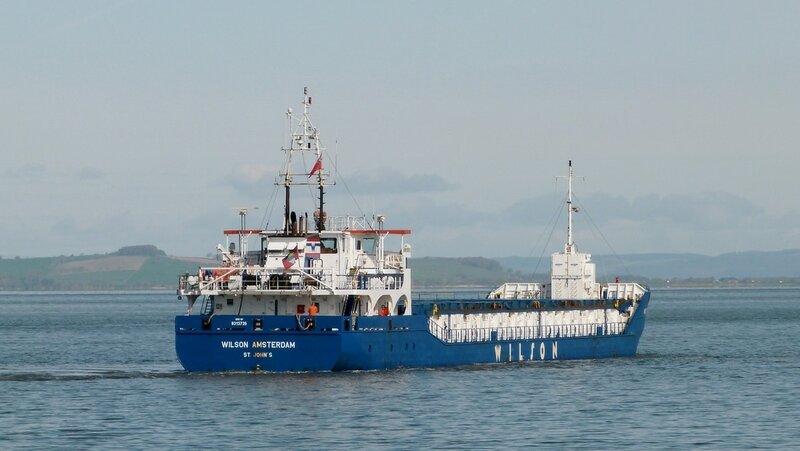 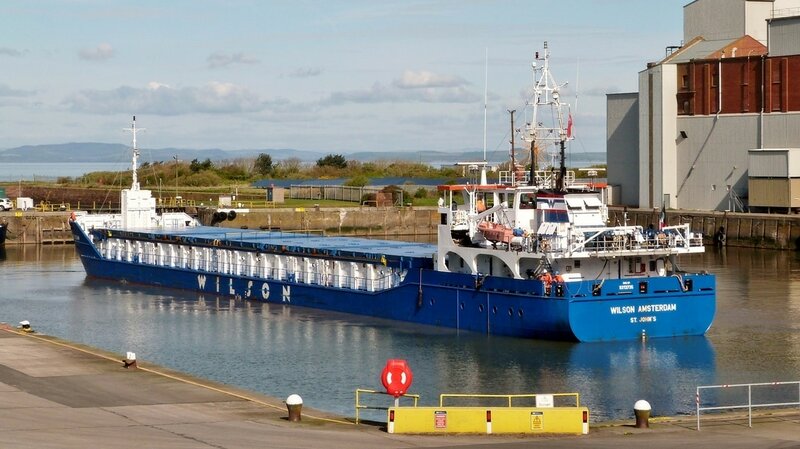 The 'WILSON' ship arrives off Silloth with a delivery of fertiliser from Gdynia, Poland. 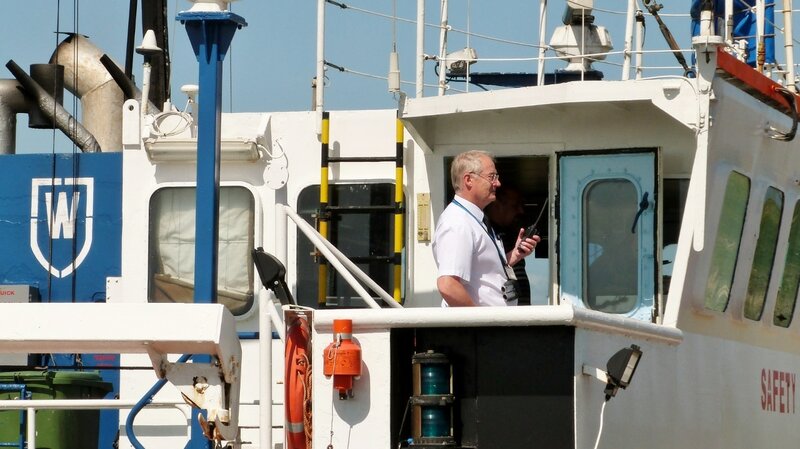 In the 20mins between arriving off the port and making her entrance the sun comes out to the relief of photographers. ​"JUMBO" is one of only a few from the 'WILSON' fleet without the 'Wilson' prefix to her name. 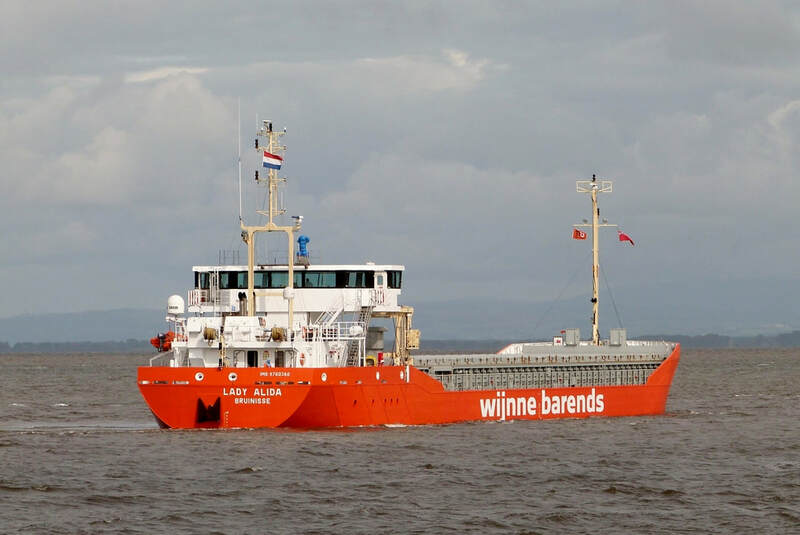 The 3,700ton DWT was built in 1987 at the Dutch 'BODEWES' shipyard and her name has remained unchanged since then. 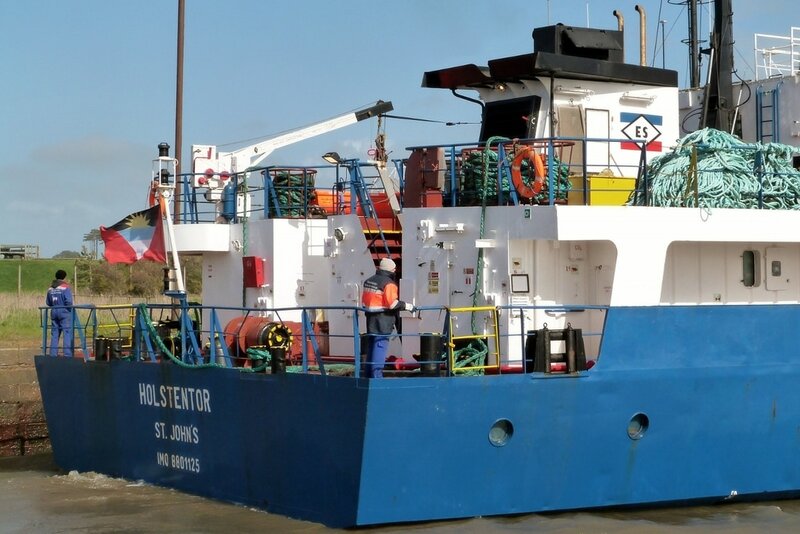 The photo of the stern shows a full identification, IMO number, company funnel logo, port of registry as Bridgetown & flag of Barbados. Inbound from Hamburg on a gloomy afternoon. The 3000ton DWT general cargo vessel built in 2000 is operated by 'AMADEUS' shipping. 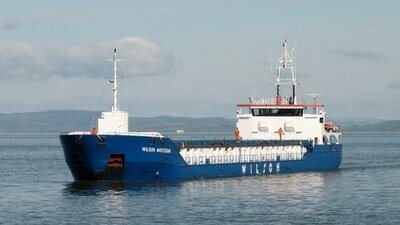 The company owns 9 other vessels of similar size all engaged on short sea routes across Europe. 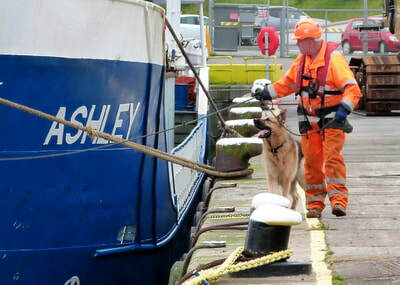 ​The gallery shows 'ASHLEY' waiting off the port, approaching the dock entrance, turning in New Dock, tying-up at the quayside & being unloaded the following day. 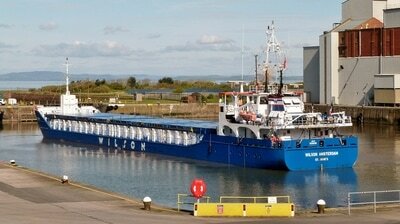 A late afternoon departure for Belfast in ballast. 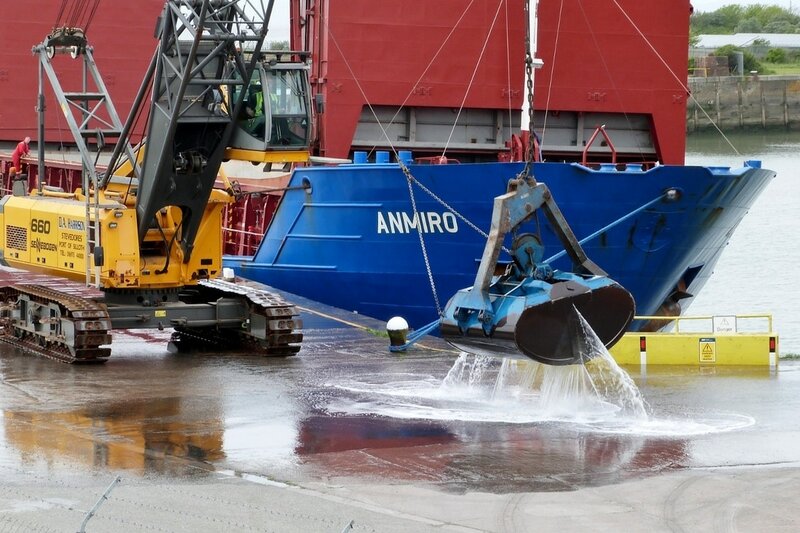 ​Once unloaded, the quayside is washed down & 'ANMIRO' made ready for departure. 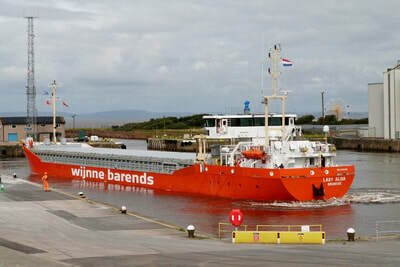 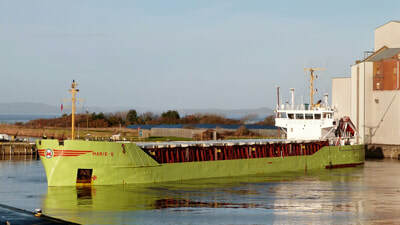 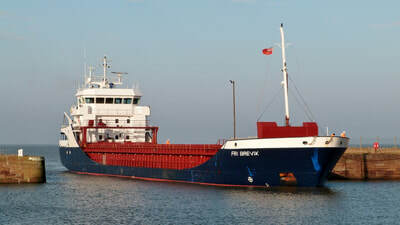 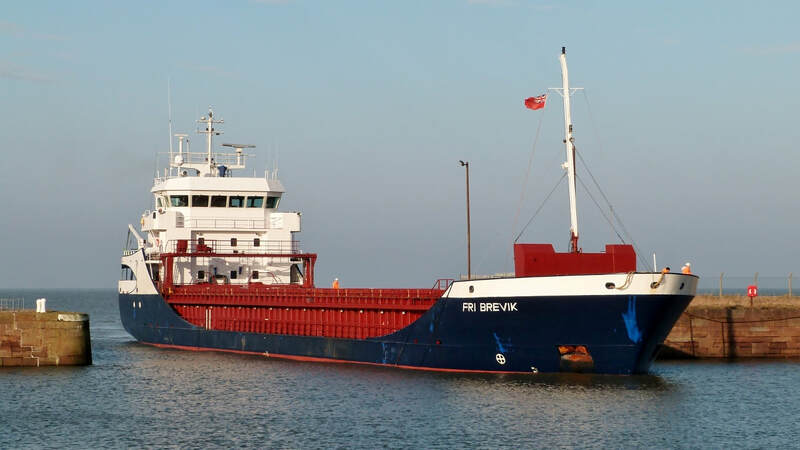 ​The general cargo vessel had arrived 2days earlier with French wheat from La Pallice on the Atlantic coast. 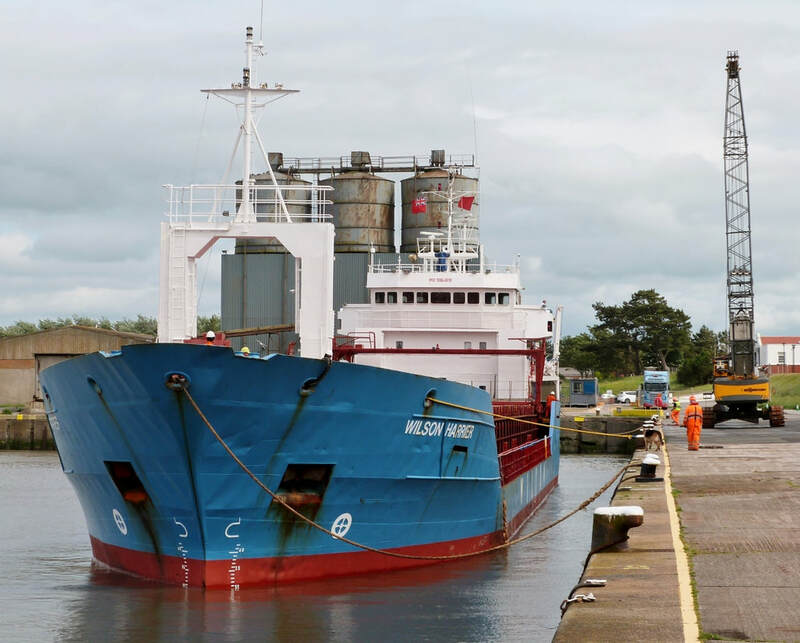 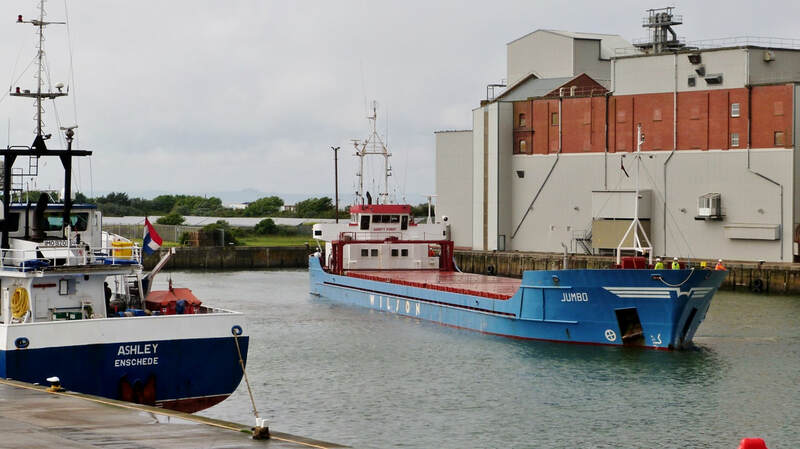 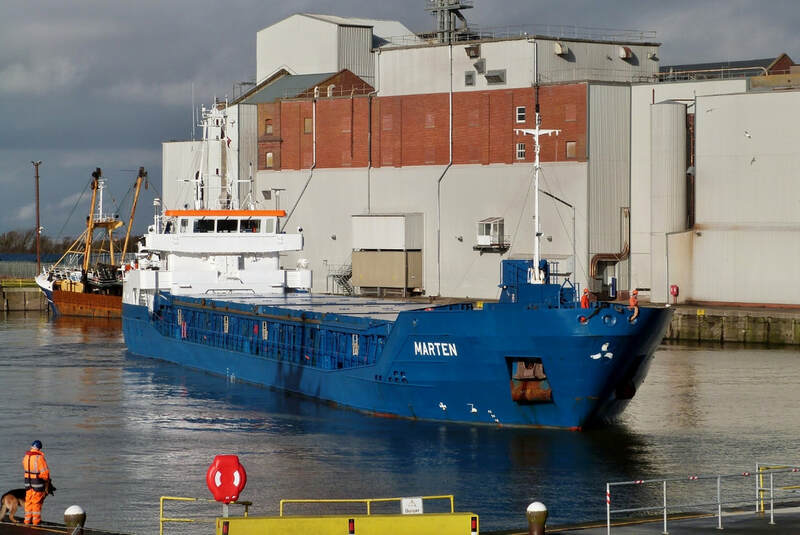 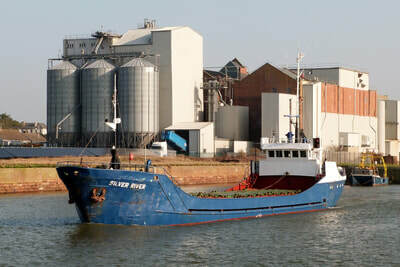 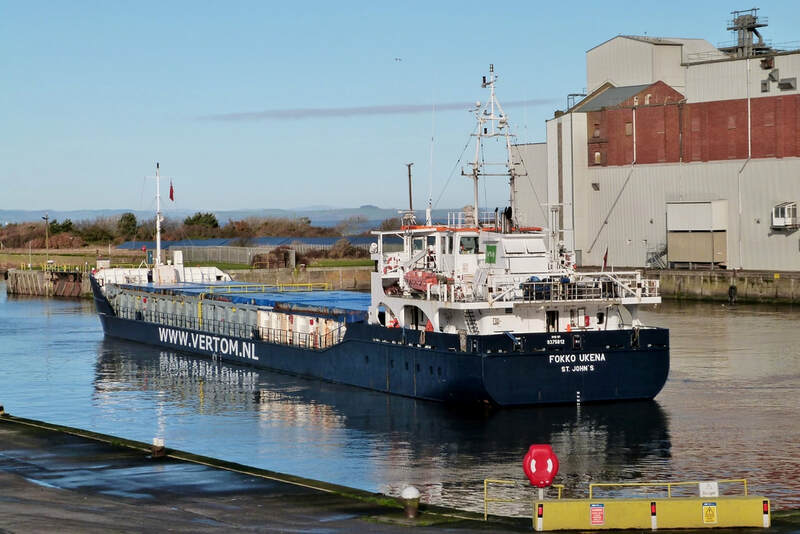 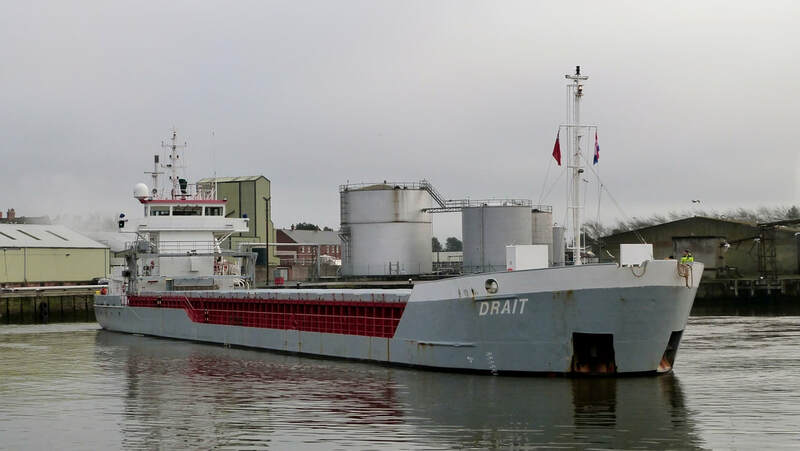 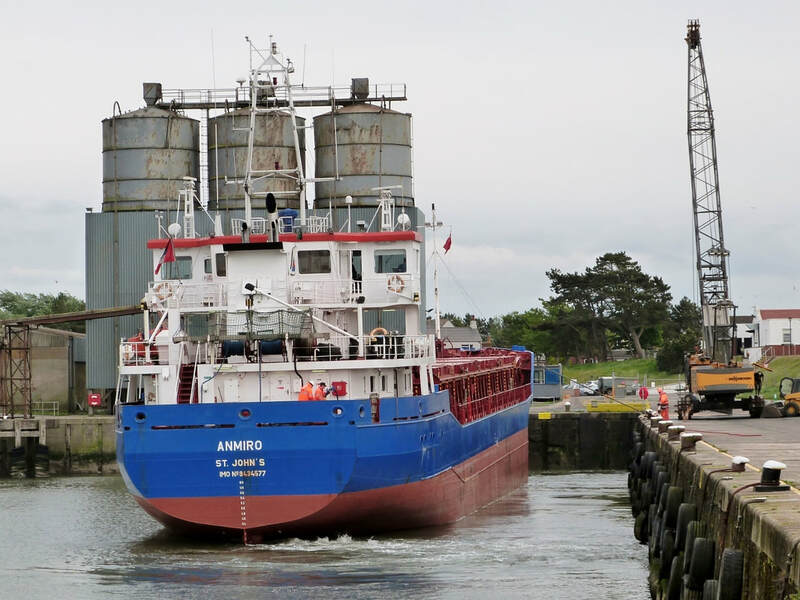 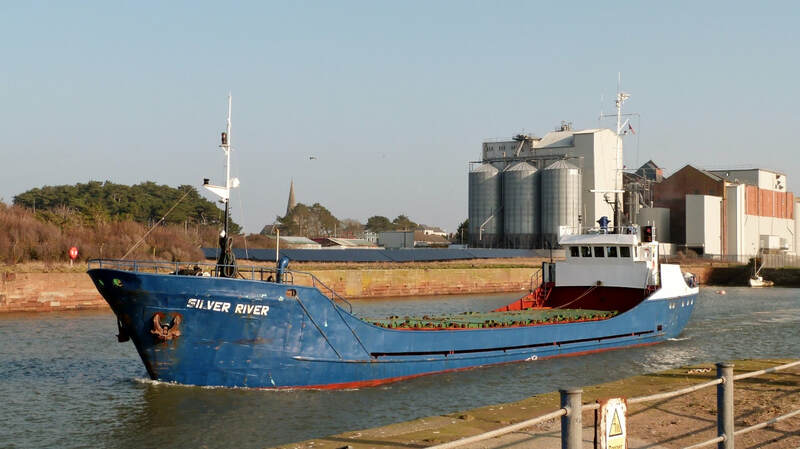 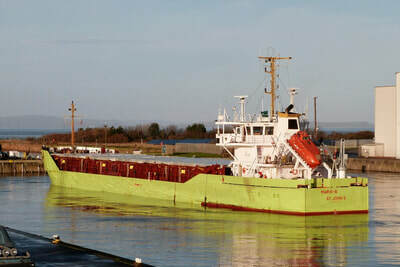 Silloth receives regular deliveries from the port which is the second largest for the export of grain in France . 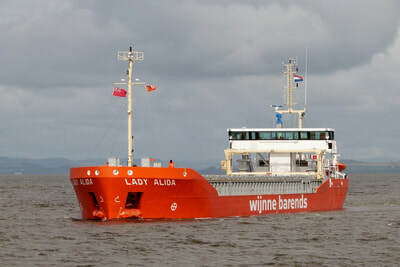 ​This has been the first visit for the 3,700 ton DWT vessel built in 2009 and managed by 'BRIESE SHIPPING' of Germany. 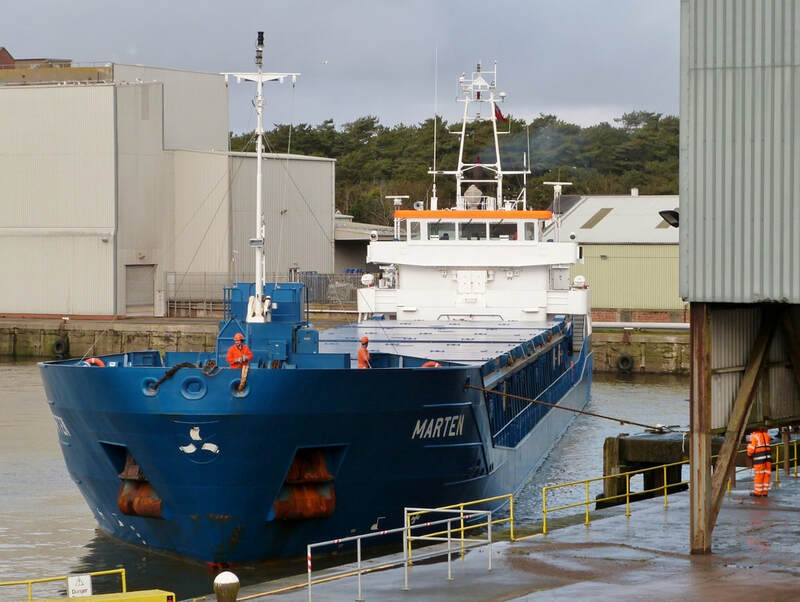 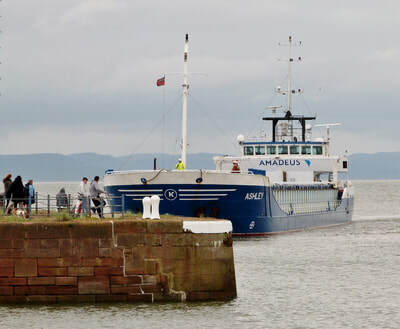 The gallery below shows the vessel pulling away from the quayside and turning in the dock before passing through the dock entrance into Marshall Dock & then the Solway. 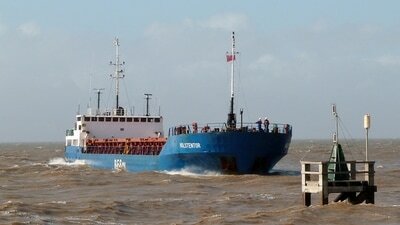 A good turnout of spectators for the arrival on a bright & breezy Sunday afternoon. 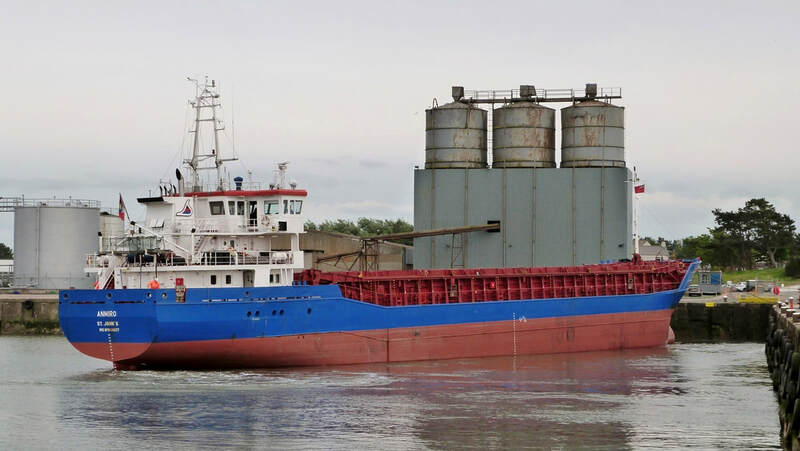 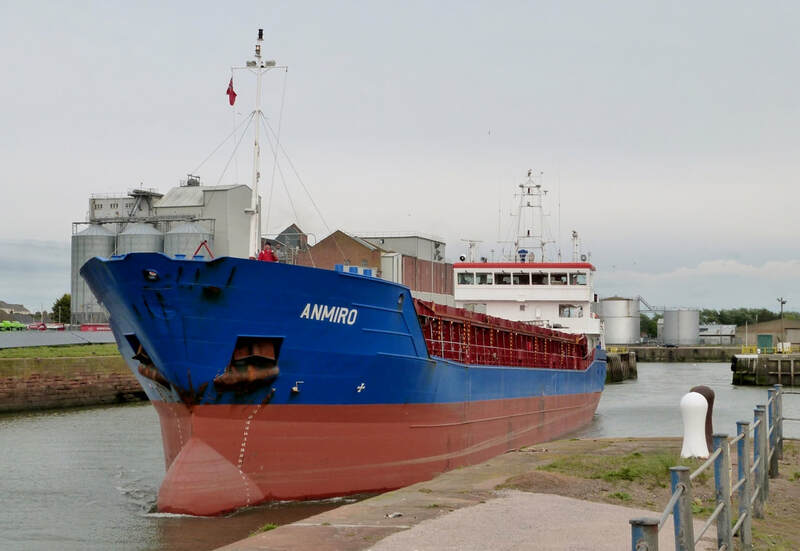 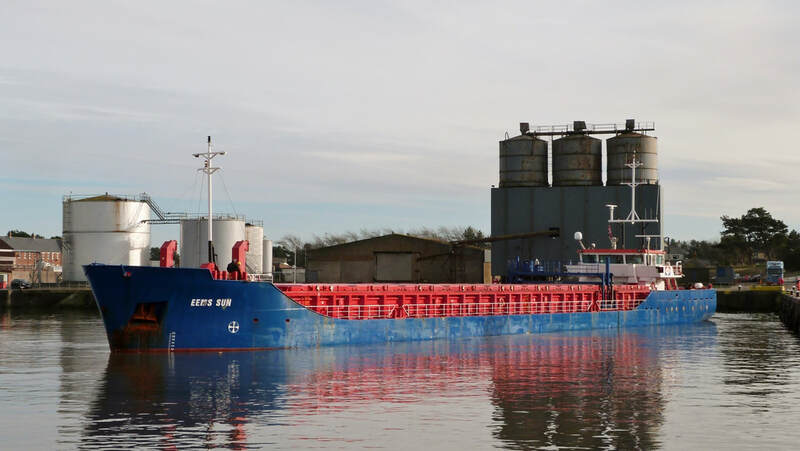 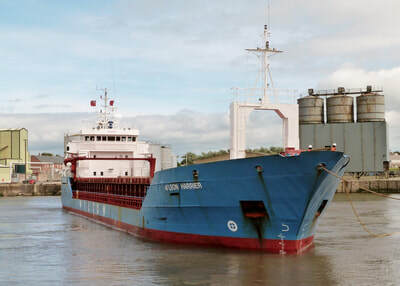 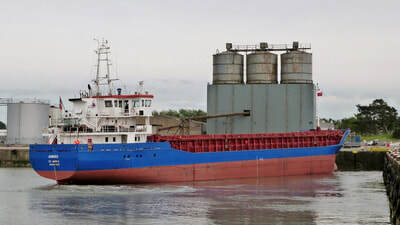 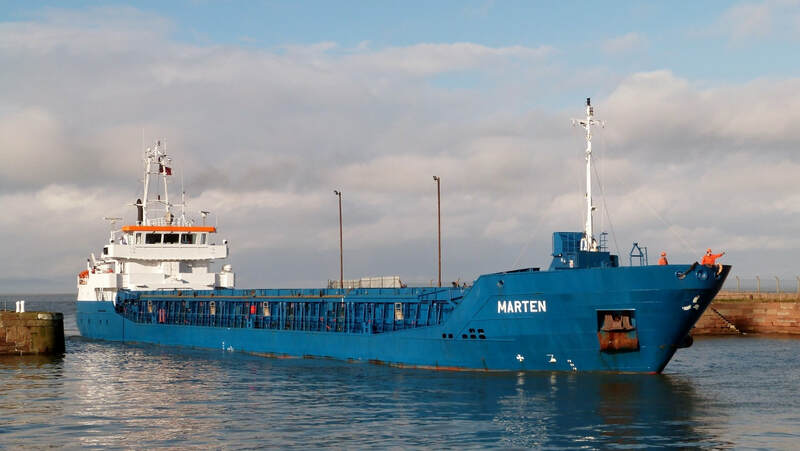 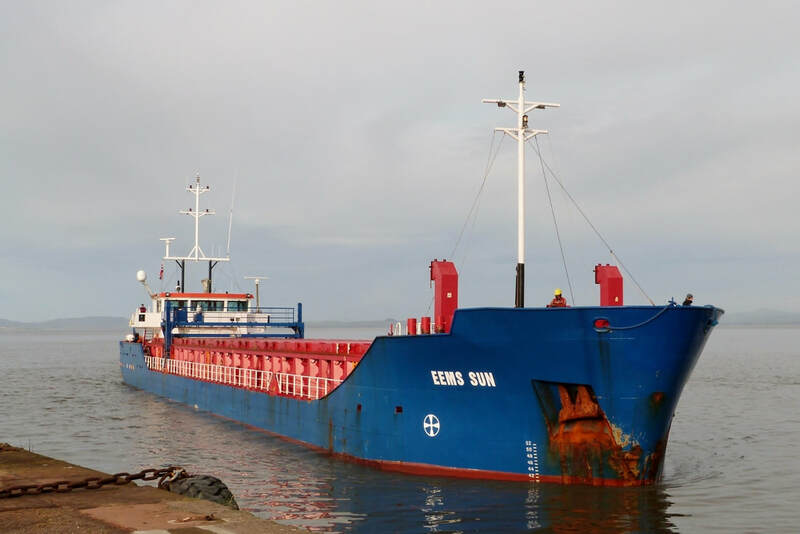 The general cargo vessel had set out 10days earlier from the Spanish port of Sagunto with its cargo of fertiliser. 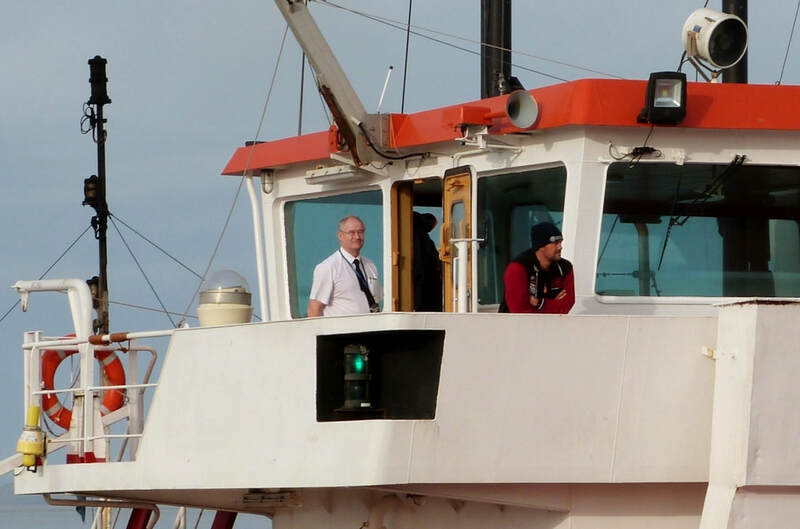 ​The pilot is seen on the bridge controlling operations as the vessel approaches the entrance to New Dock. 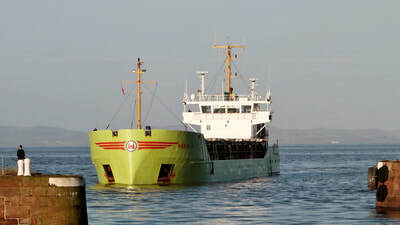 The vessel built in 1989 is flagged in Vanuatu an island in the Pacific to the northeast of Australia. 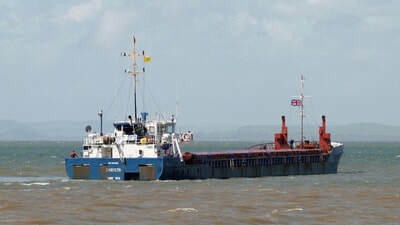 The funnel bears the logo of London operator 'Wakes'. ​This is the furthest north the ship has sailed this year. Up until now she has been confined to the Mediterranean & Black Sea. 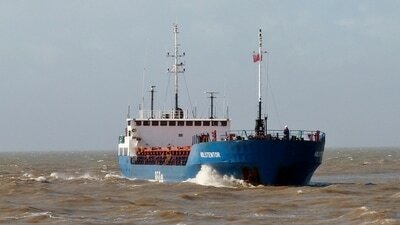 She is capable of a speed of 8 to 9 knots but most of the sailing to Silloth was at 6knots, hence the 10day voyage. 'CHRISTA' is her fourth name change; this must have occurred quite recently as there are few photos of her bearing this name on the internet. ​The gallery below shows the approach & passage into New dock. Once secure, there's plenty of activity at the quayside. 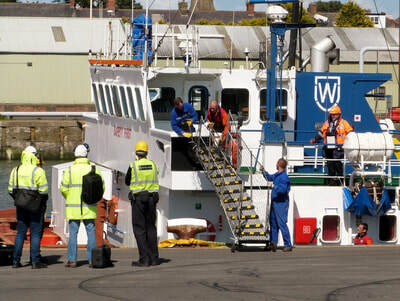 A fresh crew have flown in and make their way to board. 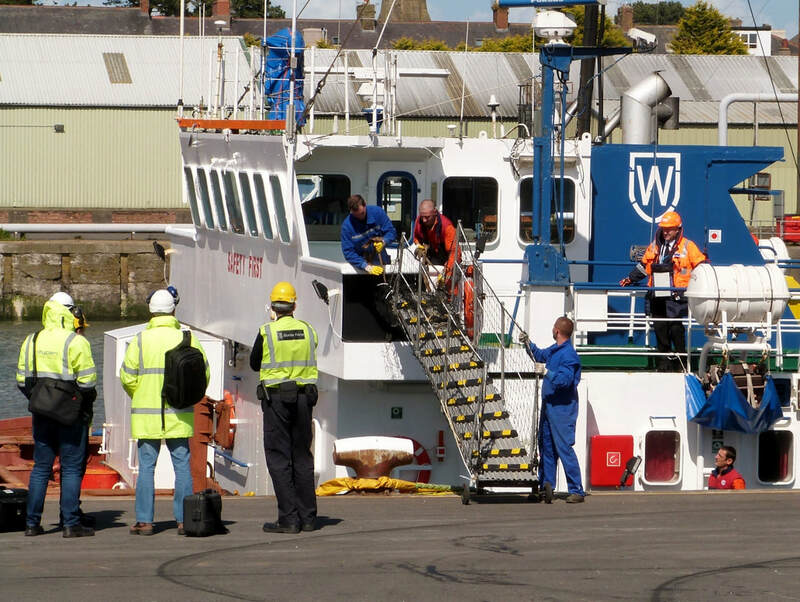 The gangway is deployed to allow the pilot to disembark & officers from the Border Force to begin their inspection. 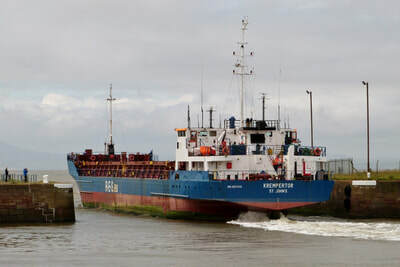 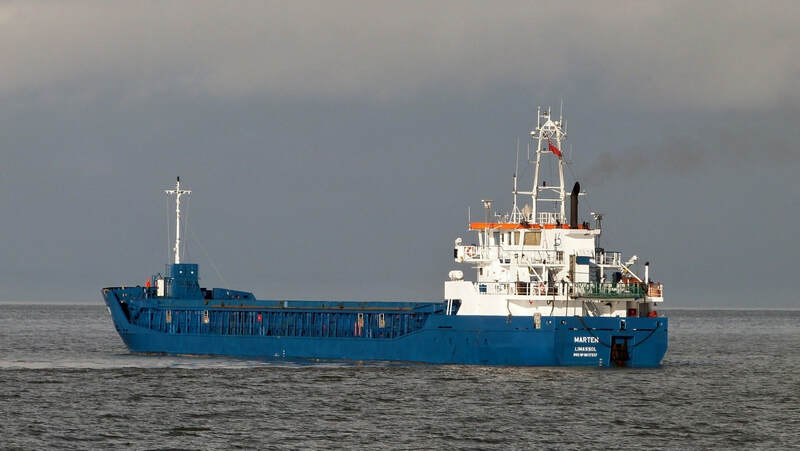 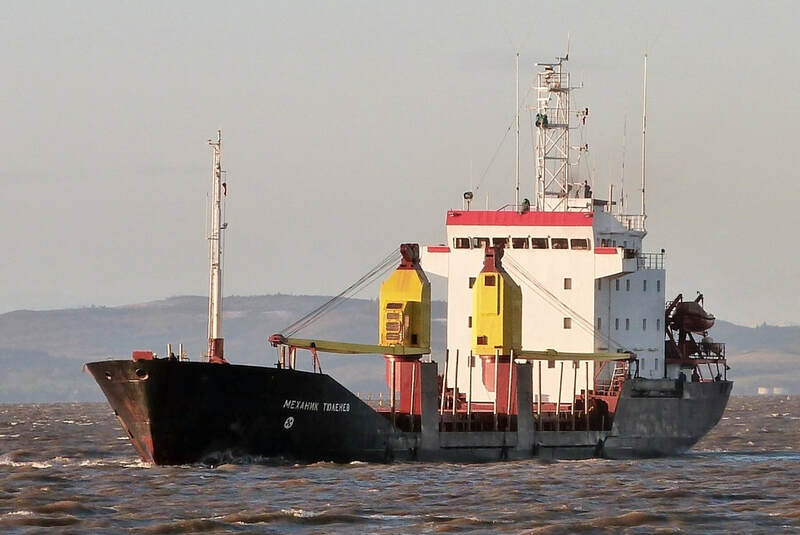 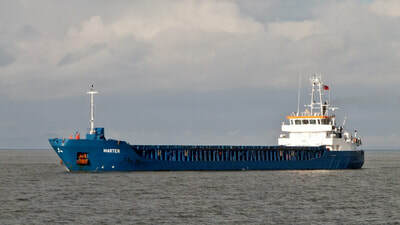 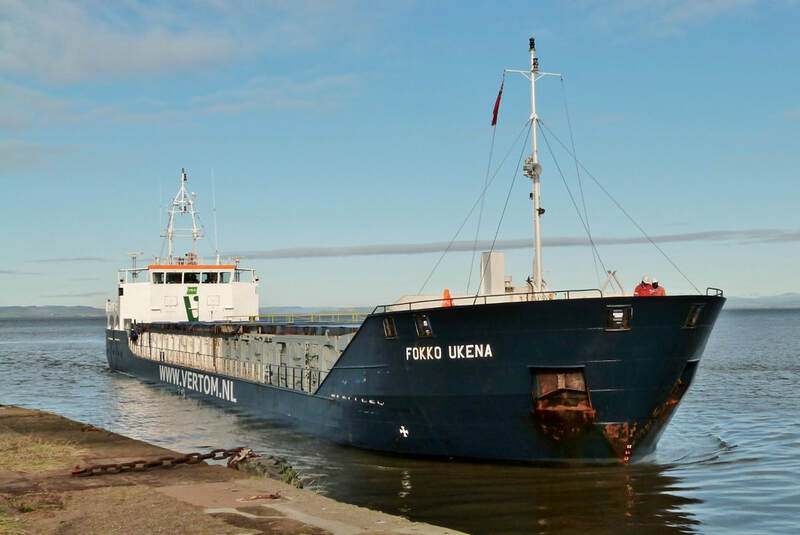 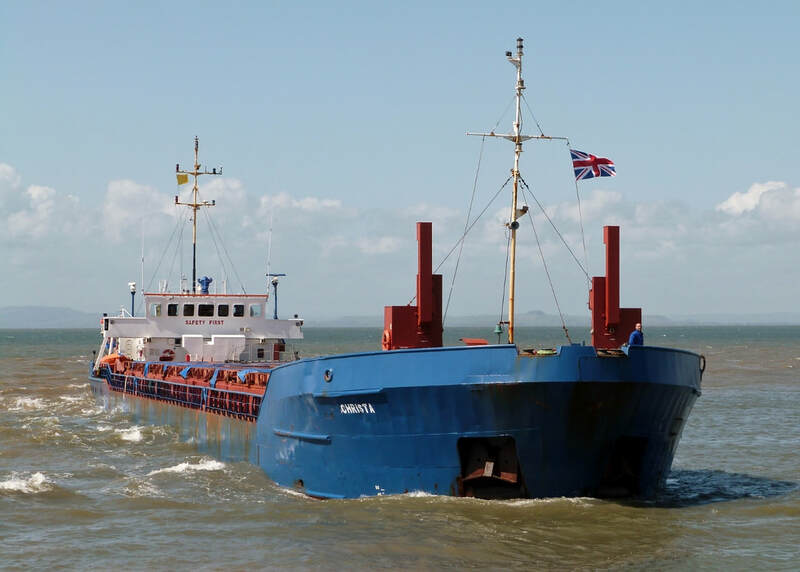 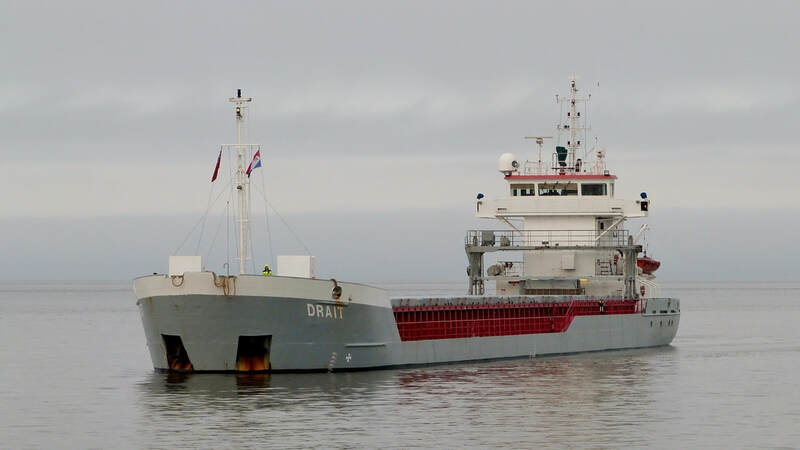 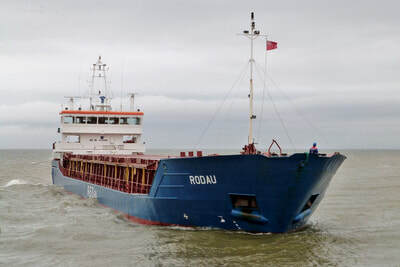 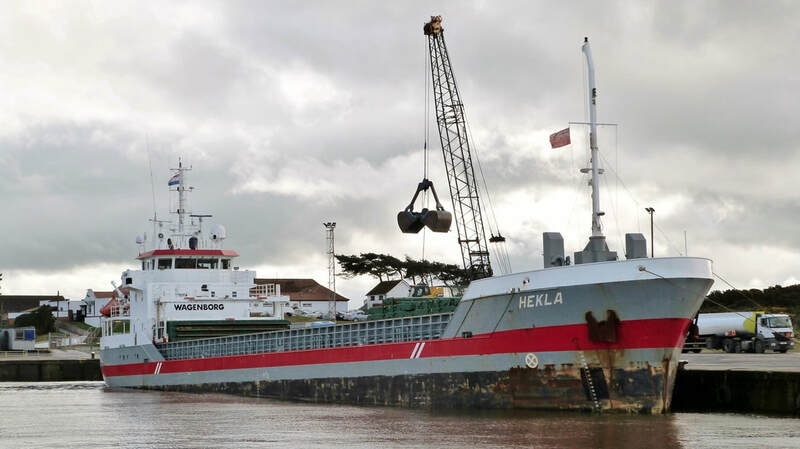 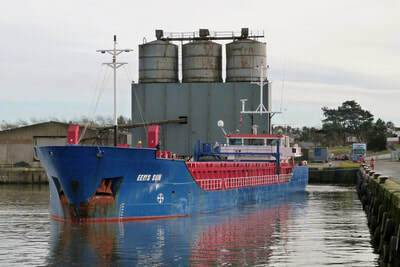 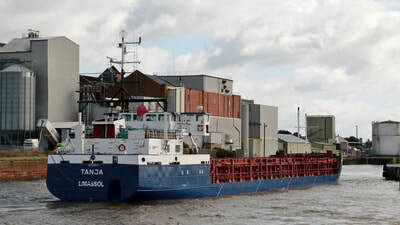 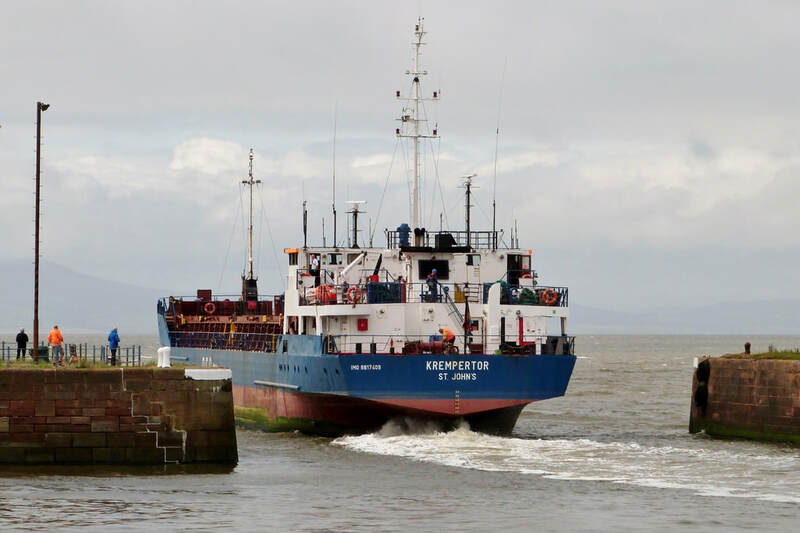 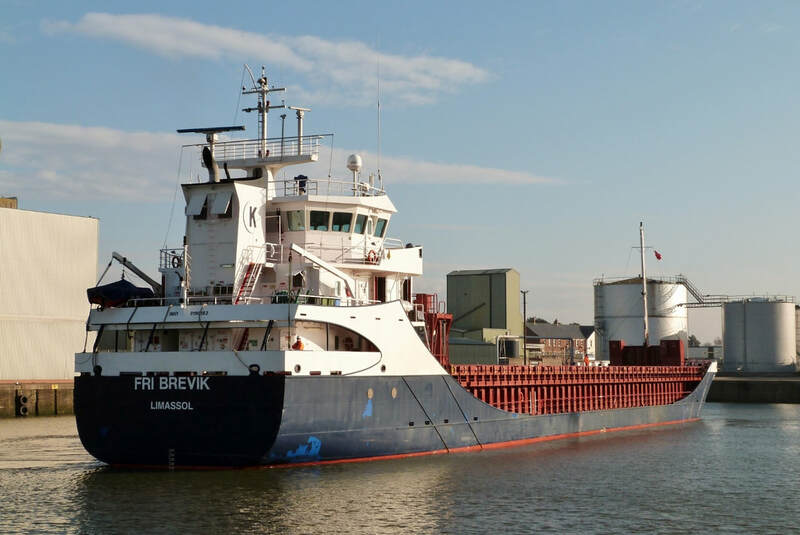 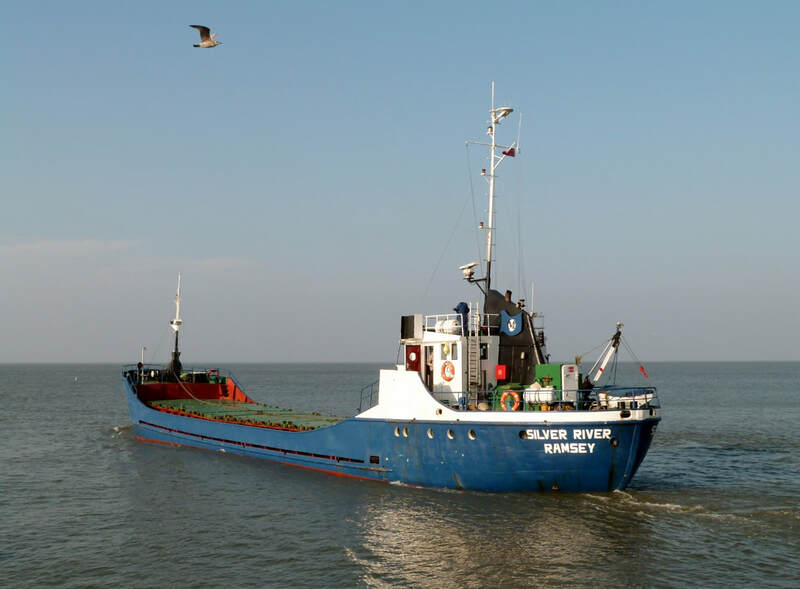 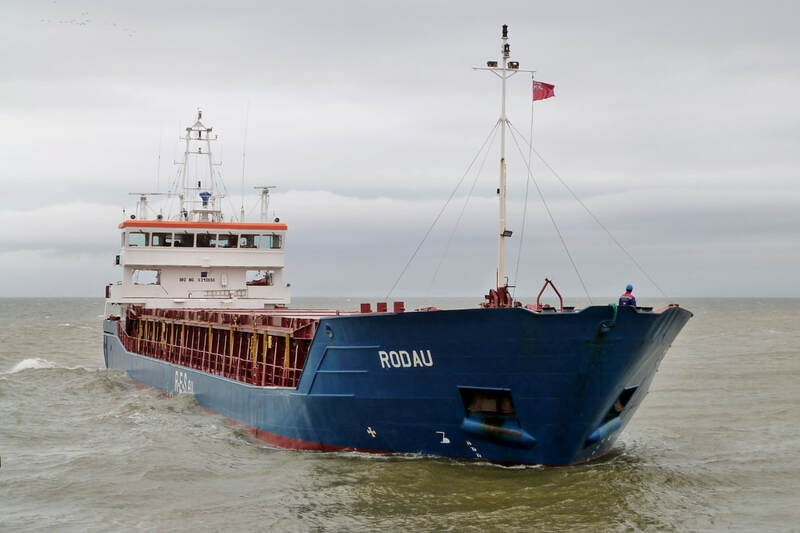 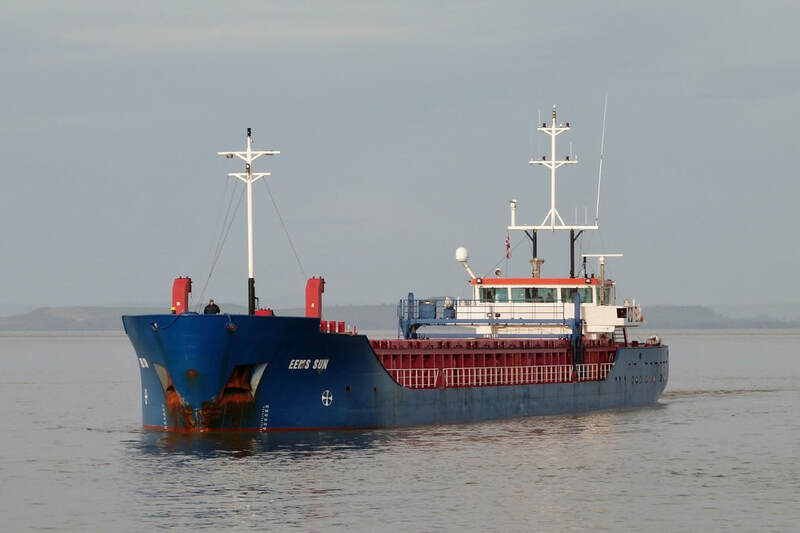 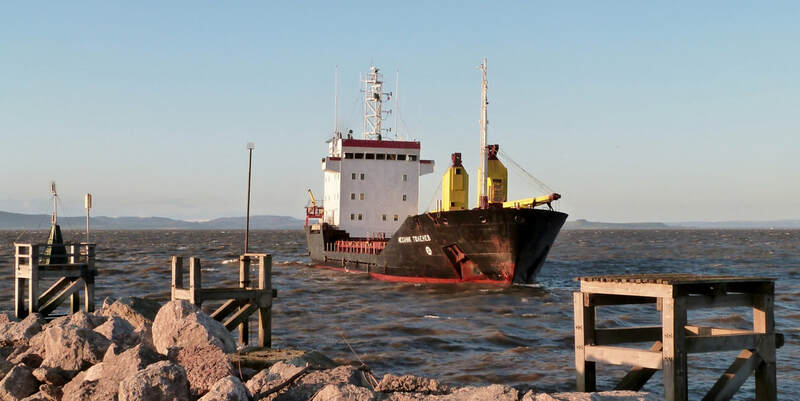 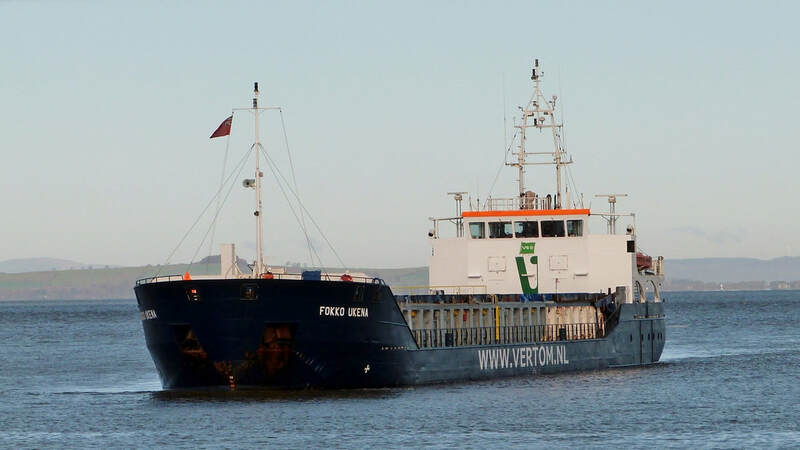 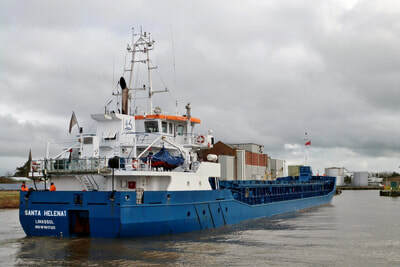 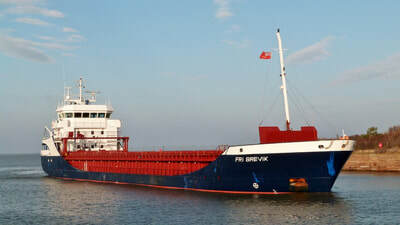 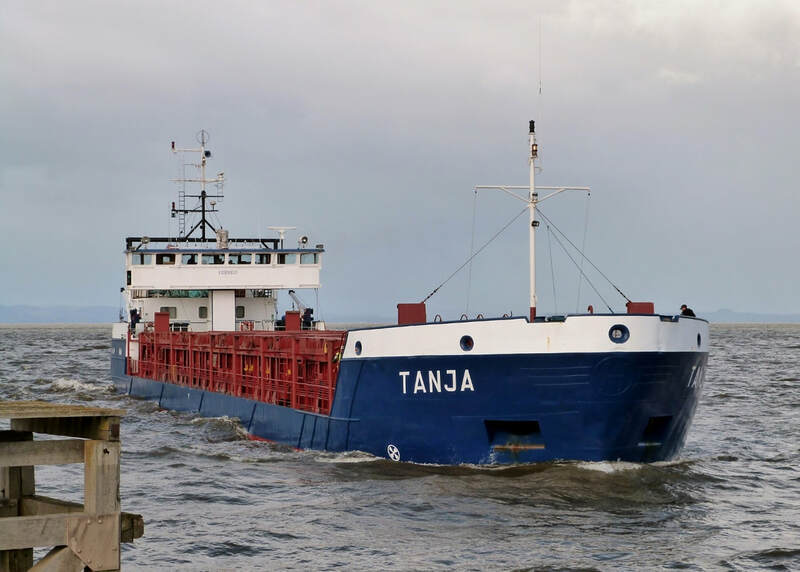 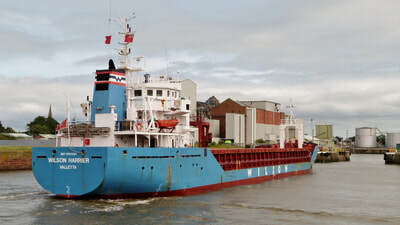 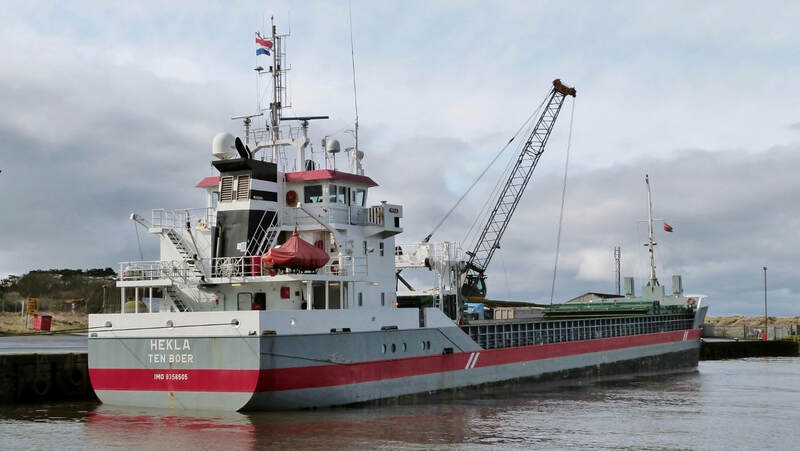 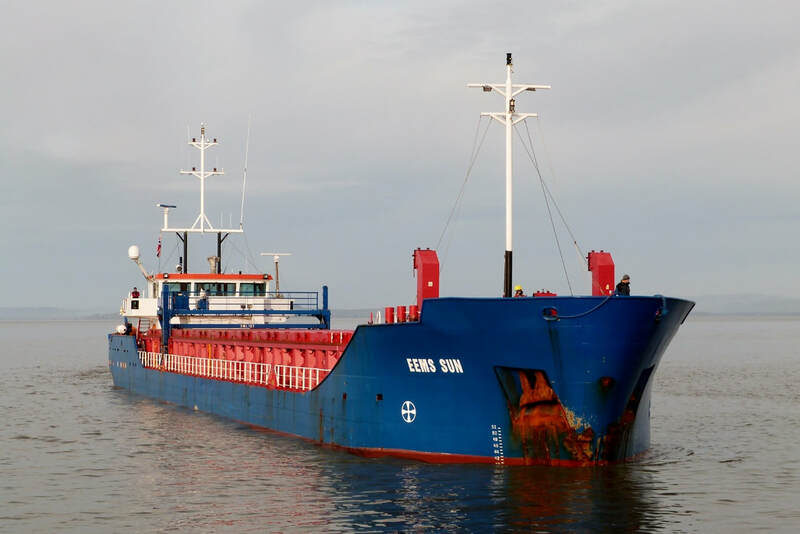 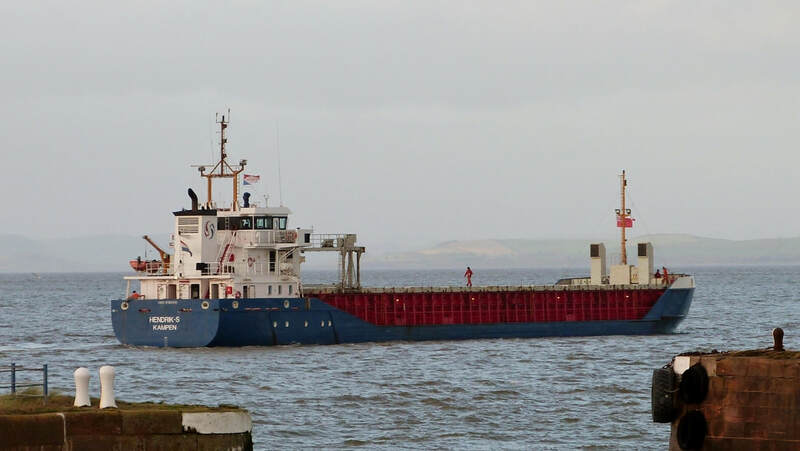 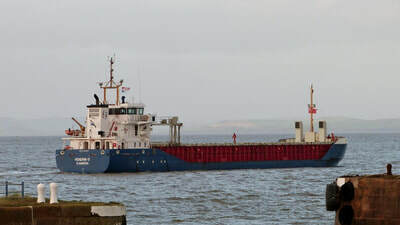 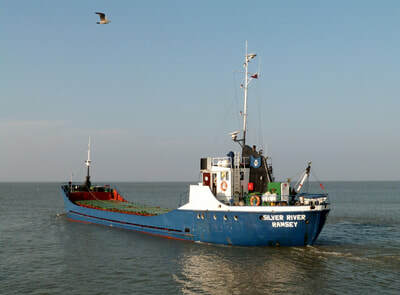 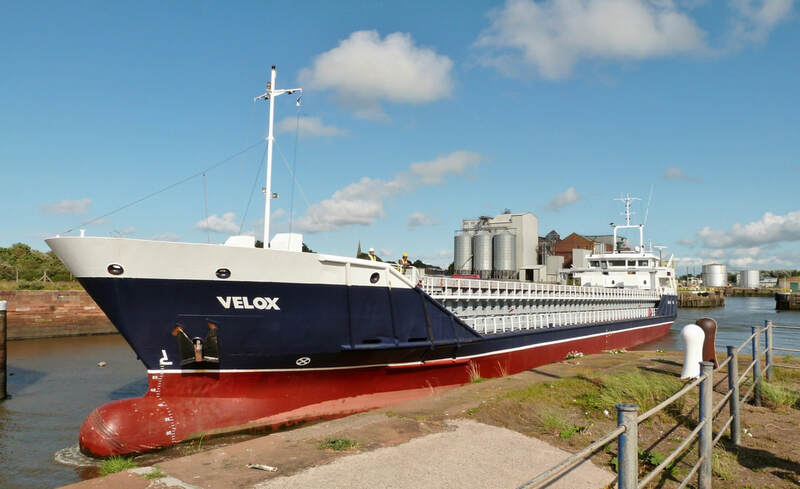 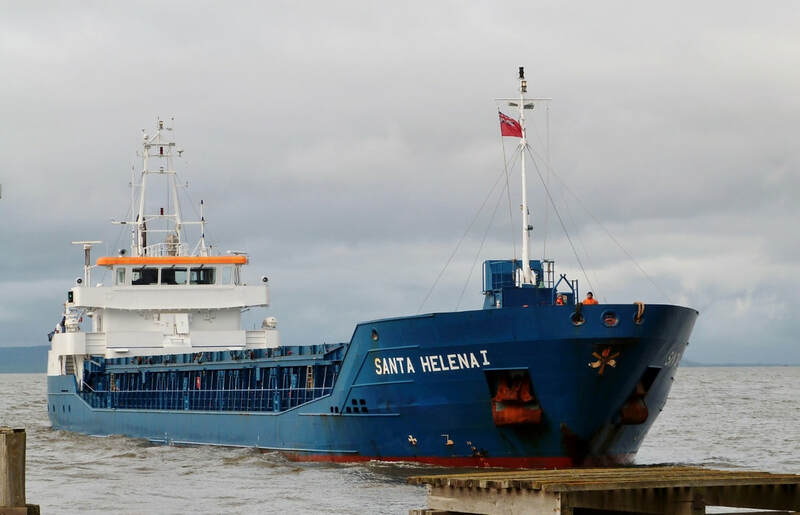 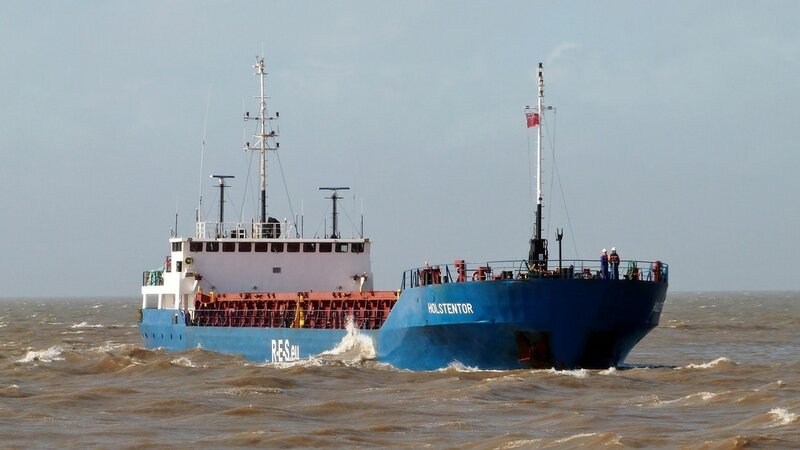 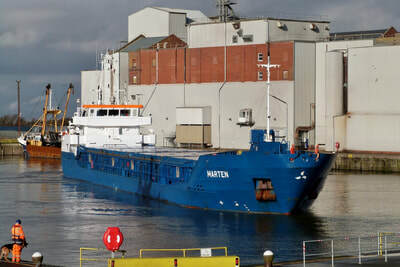 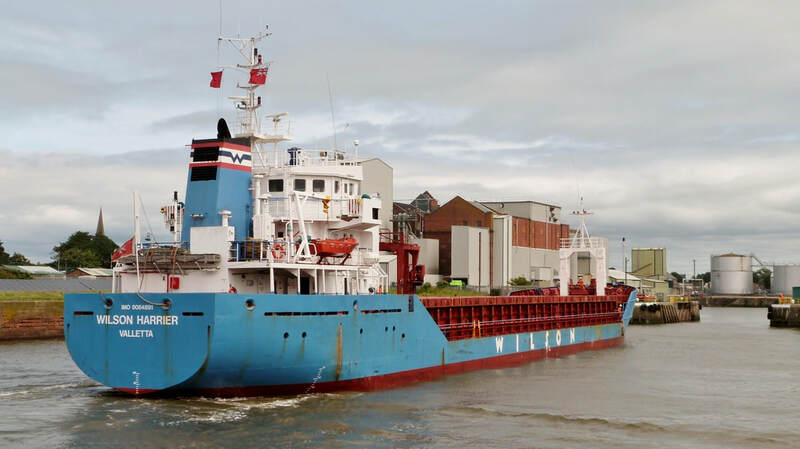 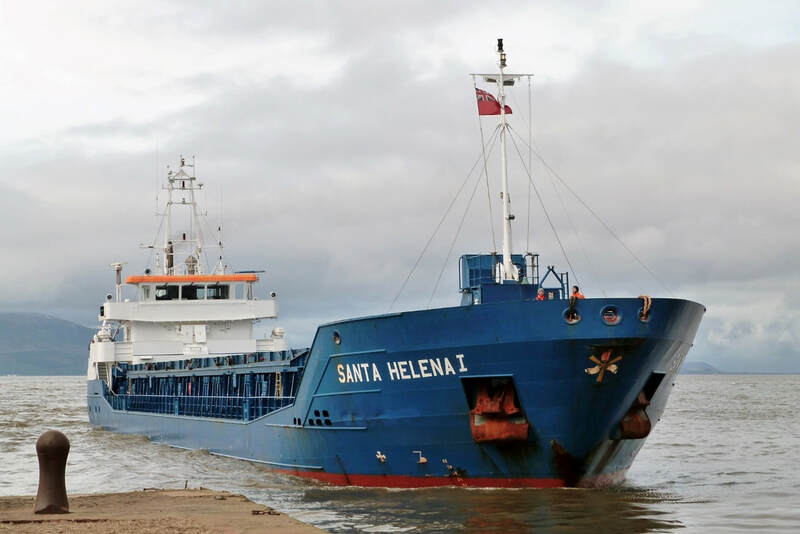 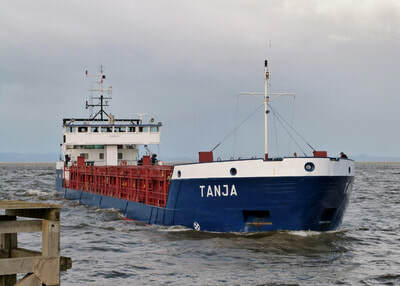 The general cargo vessel arrives off Silloth from Lithuania with a cargo of fertiliser. 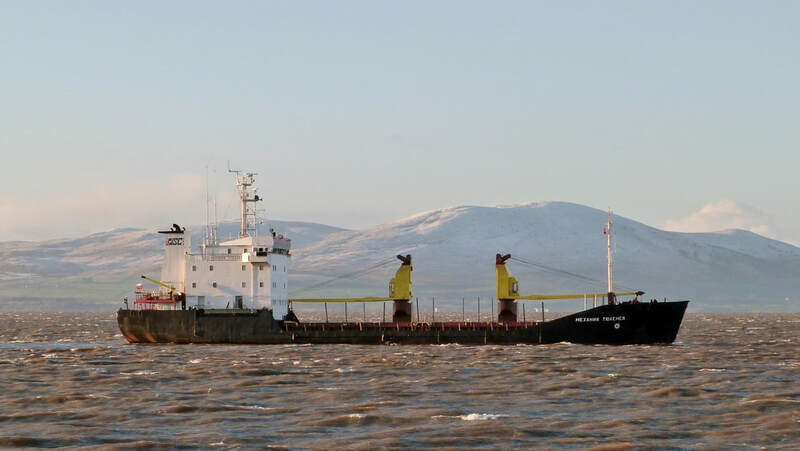 It's a bright Spring morning with excellent views of Criffel across the Solway . ​It's been a 6day sailing from the Baltic port of Klaipeda via the North Sea, Pentland Firth & West of Scotland. 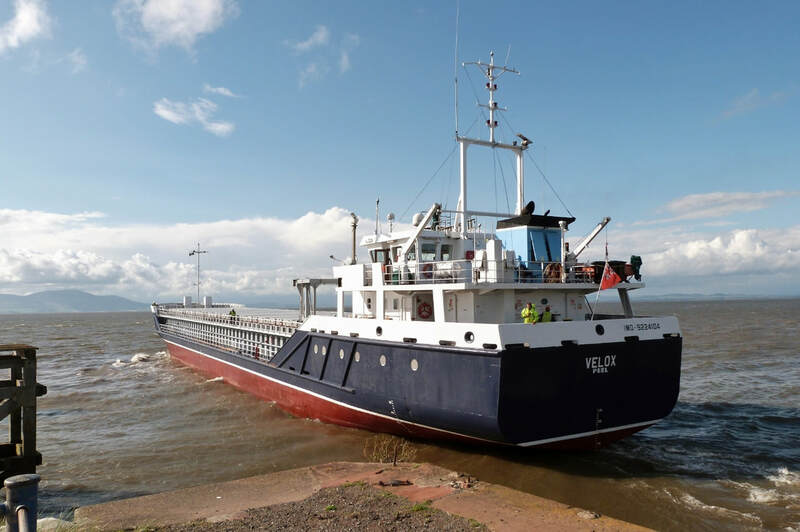 ​Due to tidal conditions she had to lie at anchor off Workington for a further 2days to await a tide of sufficient depth to enter port. 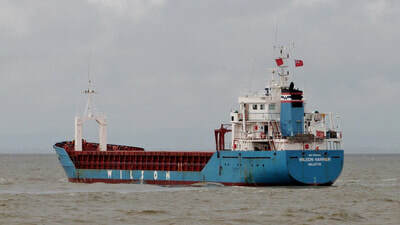 The ship is one of more than 60 mid-sized vessels either owned or on time charter by the Norwegian company 'WILSON'. 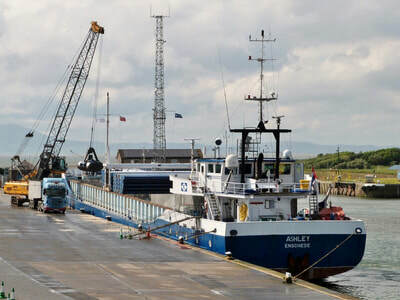 ​The gallery shows the approach to the port entrance, passing into Marshall Dock and finally drawing alongside the unloading quay 30mins later. 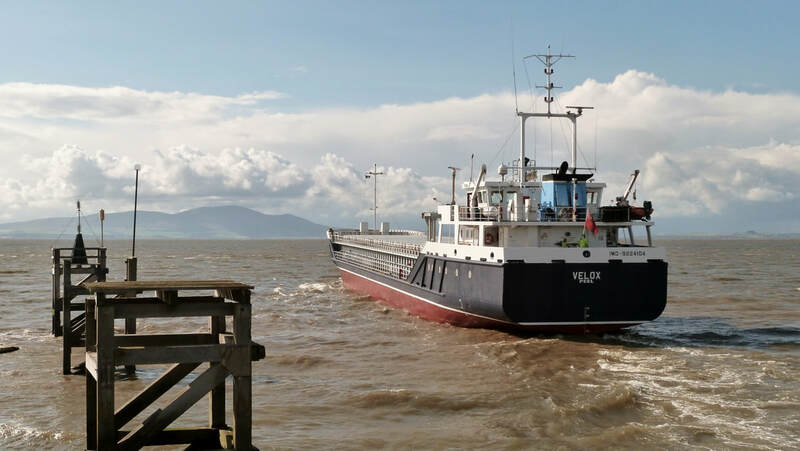 Arriving off Silloth on a blustery afternoon with wheat from the French port of La Pallice. The strong southwesterly & heavy swell at the dock entrance tests the pilot's skills. 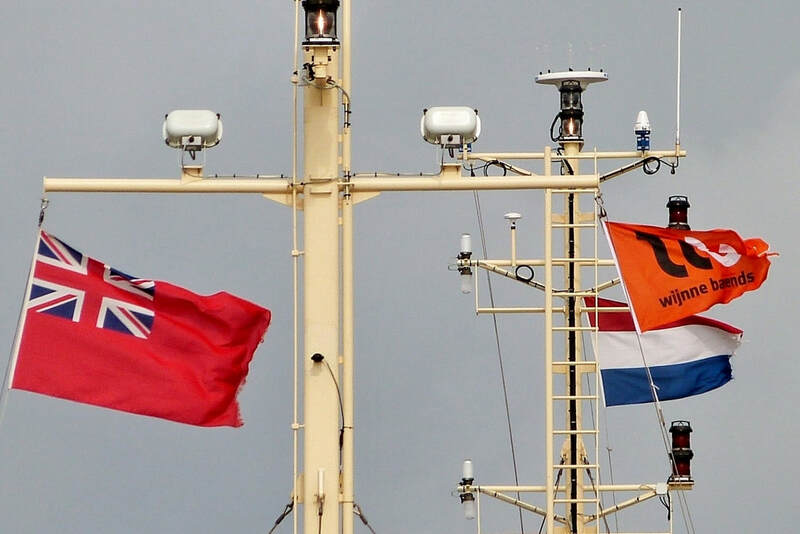 ​national flag of Antigua & Barbuda and funnel logo of the Strahlmann Shipping Group, RES. 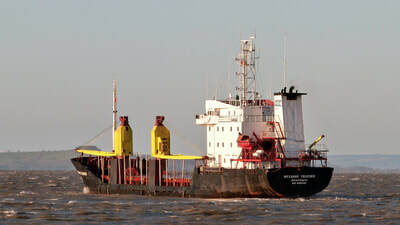 The 3,400ton DWT vessel built in 1989 copes well with the conditions. 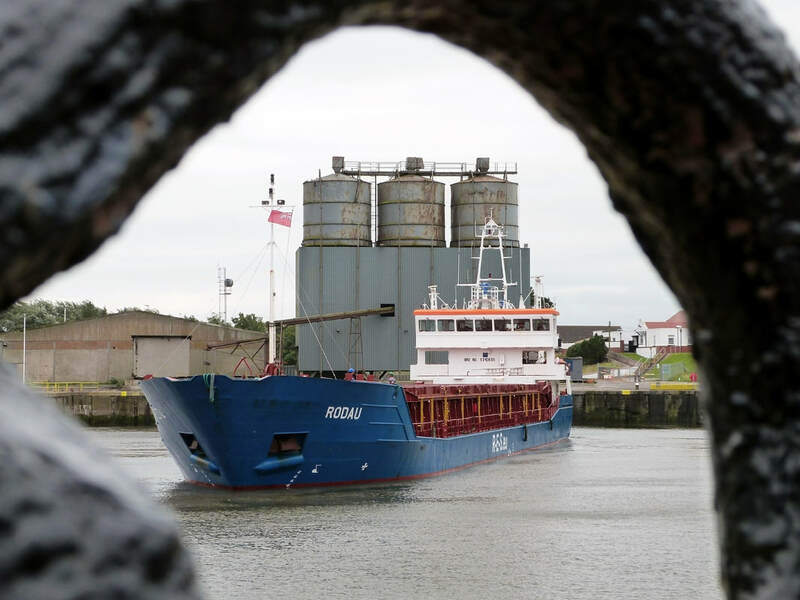 ​​The gallery shows the approach, passage into Marshall Dock where she is pushed towards the north wall & finally being made secure at the south quay. A grey afternoon for the arrival from the French port of La Pallice with 3,000ton of wheat. 'HELKA' is already berthed at the unloading quay so 'SANTA HELENA' makes her way towards a temporary berth. ​The 3,800ton DWT vessel was built in 2012 for 'Lohmann Shipping'. 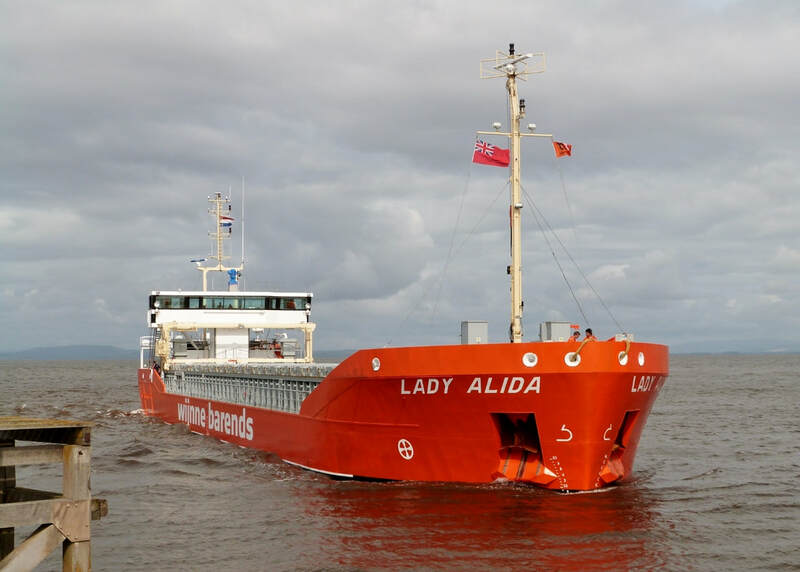 She had a name change to 'WILSON LIVORNO' in 2014 but returned to 'Lohmann' two years later. 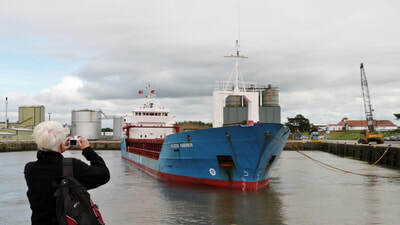 Ship enthusiasts were out in force to watch the arrival at Marshall Dock & passage into the New Dock. 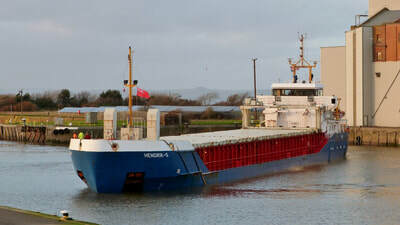 ​Seen unloading fertiliser, having arrived from Hamburg on the early morning tide. ​The 3,150ton DWT vessel is one of a fleet of 173 operated by 'Wagenborg' of the Netherlands. ​The unusual port of registry, Ten Boer, is a village on the Eems Canal between Groningen & Delfzijl. 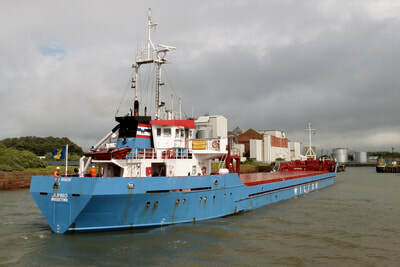 Many of Wagenborg's ships of this class are registered at smaller Dutch towns & cities. Seen in New Dock loaded with fertiliser & ready for departure to Ramsey IOM on the afternoon tide. 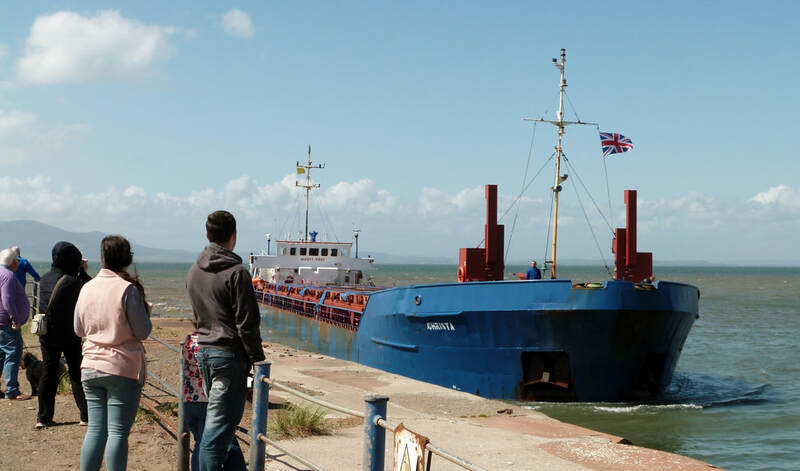 It had been a brief visit, having arrived on the previous tide. The Manx registered coaster has regular runs in the north Irish Sea from the Isle of Man to Glasson Dock & Carrickfergus, but this is the first visit to Silloth for several years. 'MARTEN' is seen arriving off Silloth on a fine winter's morning in good time to enter port on the midday tide. 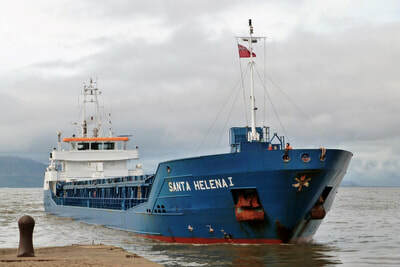 She had set out from the French port of La Pallice 4days earlier with a cargo of wheat. 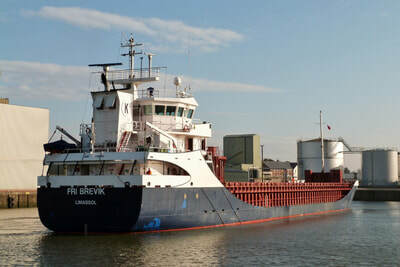 The east quay is used as a temporary berth until 'FRI BREVIK' is moved from the unloading quay. 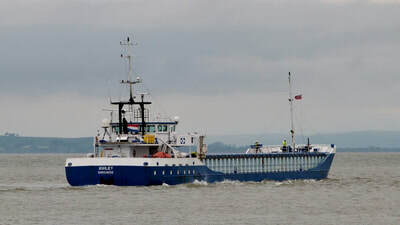 ​The 4yr old vessel, previously named WILSON LISBON, was acquired by the German company 'Lohmann Shipping' about 12 months ago. The funnel bears the company logo, HLB (Hermann Lohmann Bereederungen). 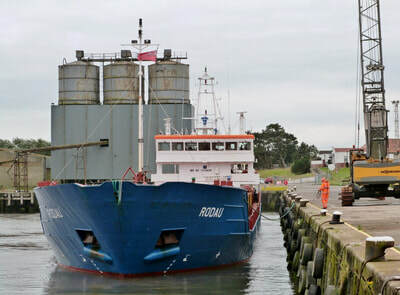 ​Inbound from Riga, Latvia with fertiliser after a 7day voyage from the Baltic via the North Sea, Pentland Firth & West of Scotland. ​​The 3,800ton DWT vessel was built in 2001 and has had two previous names, POLAR SKY & FRISIAN SKY. 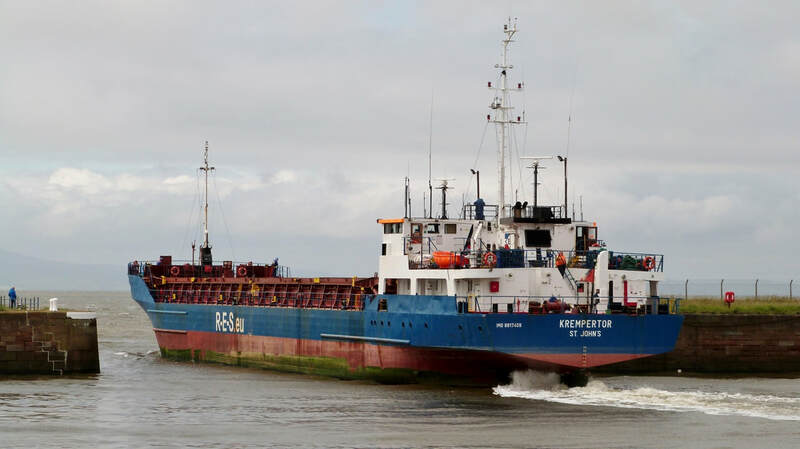 Ships belonging to ​the Norwegian KOPERVIK GROUP have been regular visitors recently; three in the last 3 months.